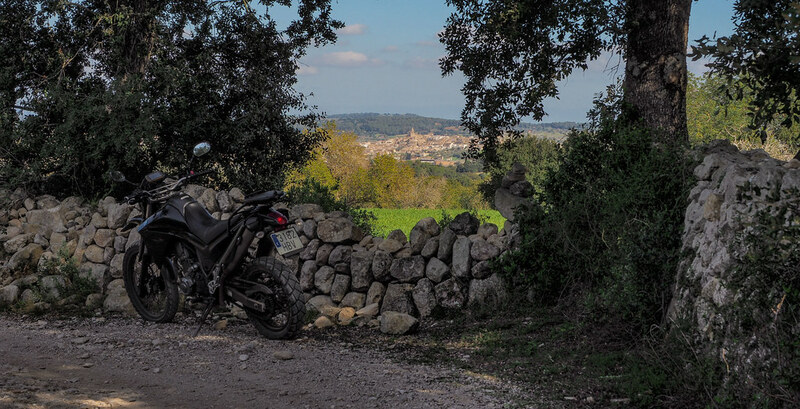 Discussion in 'Ride Reports - Day Trippin'' started by stollenvernichter, Mar 27, 2019. Withdrawal symptoms require short-term action. 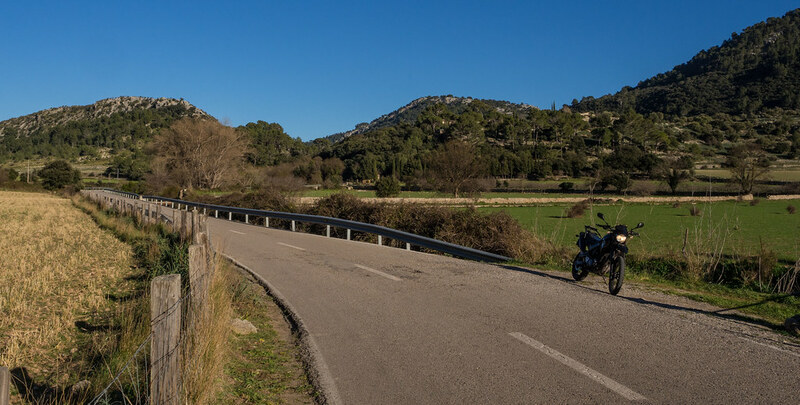 Where is it possible to drive a motorcycle for a week in late winter? 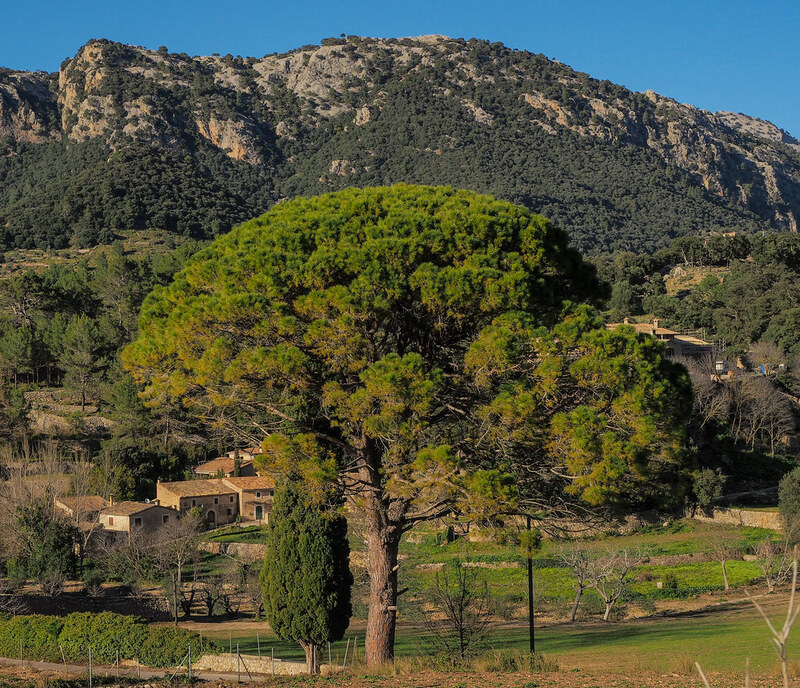 What about the weather in Mallorca? One week of sun, daytime temperatures around 15 degrees, single digit at night, sounds tempting. 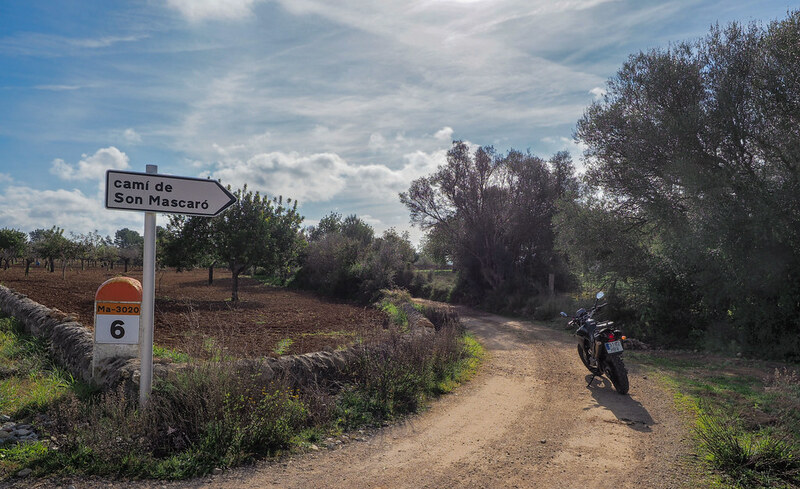 In the last decades I was often on the island, mostly on two wheels, but not motorized. 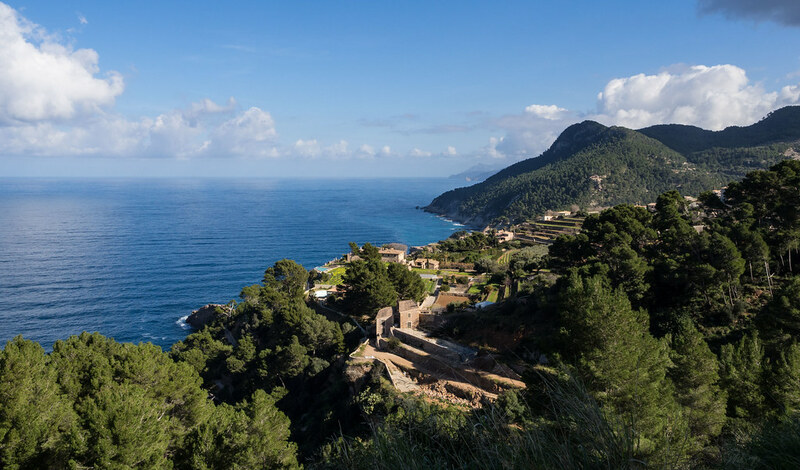 Local knowledge is available, all winding paths through the Tramuntana mountains and almost all small, paved Cami through the interior of the island are known. 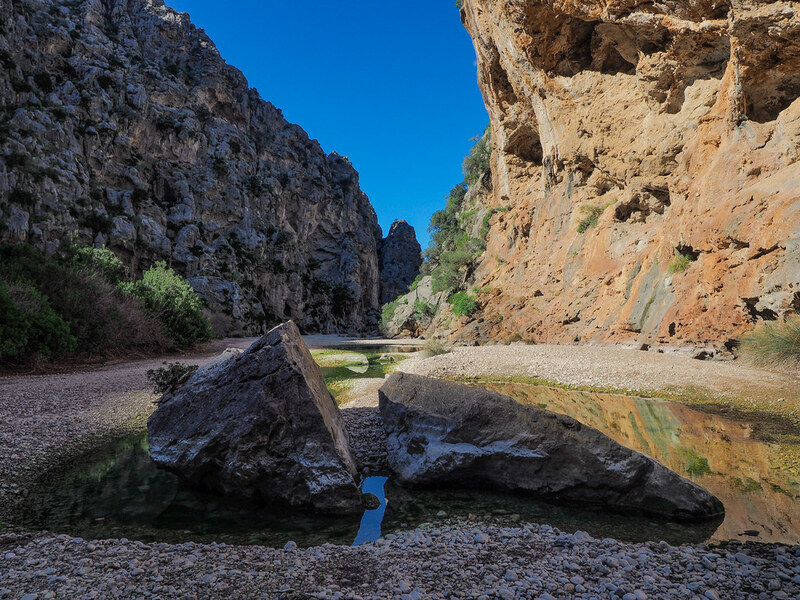 For the unscheduled rest and a little adventure there are Wikiloc tracks. 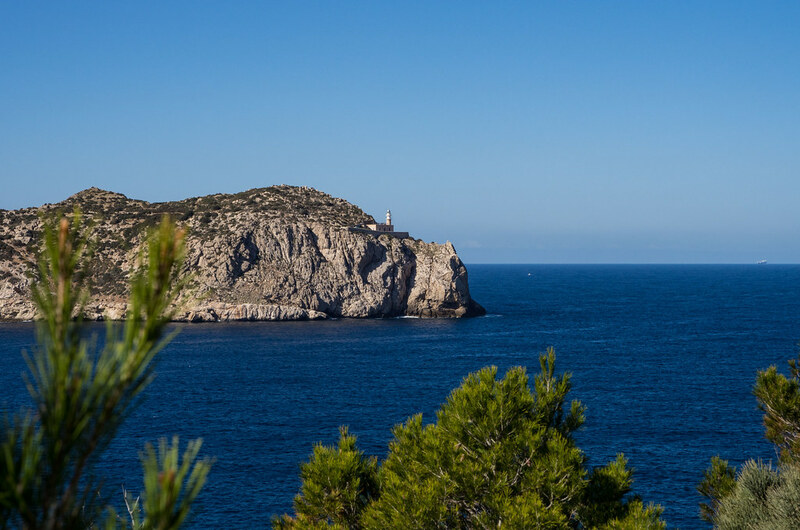 Who equates Mallorca with Ballermann, party people and lot of boose, has no idea and misses a very beautiful islet. 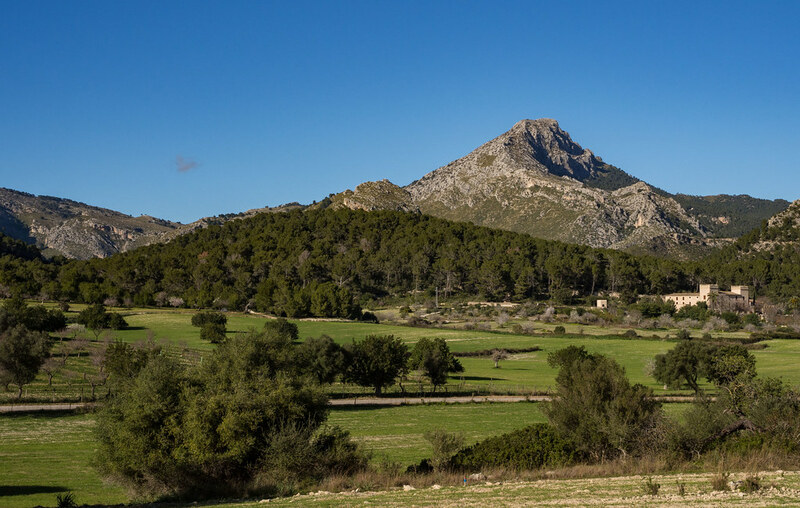 Yes, the reduction is already correct, because the Balearin is not that tall, has lots of hills in the right places and is slim and slender in the middle section. 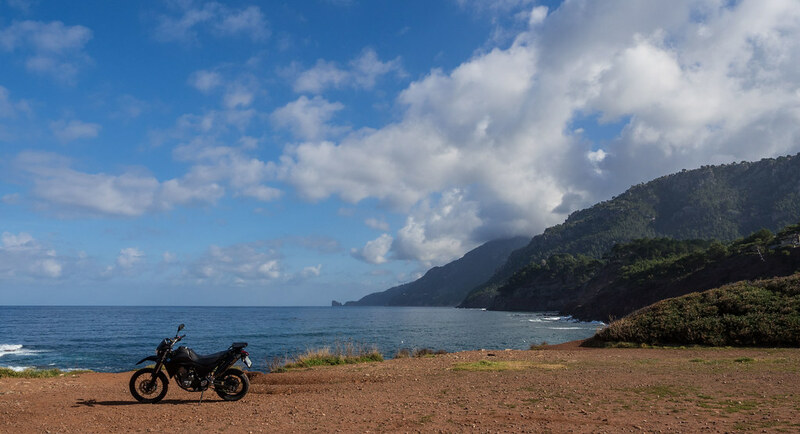 To explore the island by motorcycle and the most beautiful routes one week is enough. Of course, what you rent depends on your own preferences. Harley riders will not enjoy off-main routes and the holiday could be in working order. 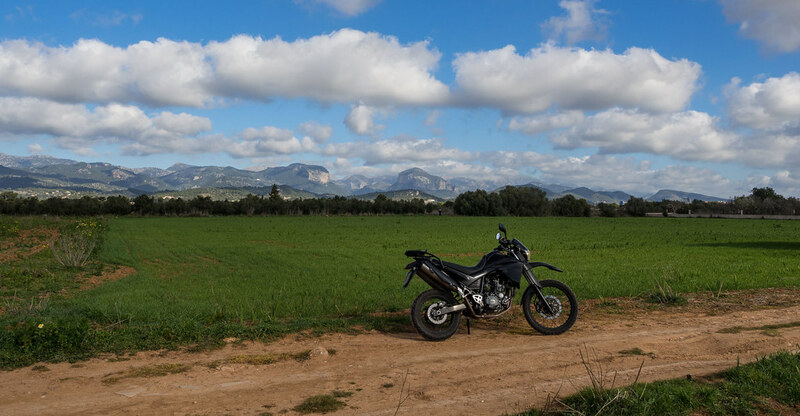 In my opinion, a handy enduro bike with 50 hp is the ideal device. But also a big GS should go, if you have fun wagging it through narrow serpentine. 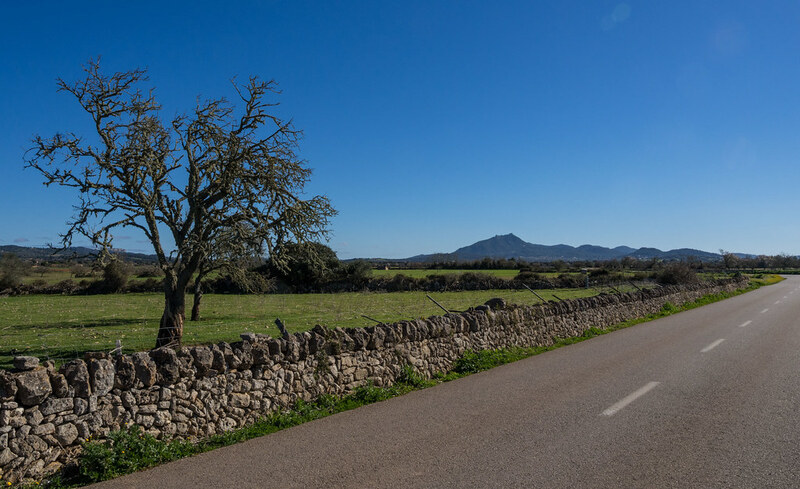 Incidentally, even in Mallorca the maximum speed is 90 km/h, but this is no problem, long, straight roads are the exception. 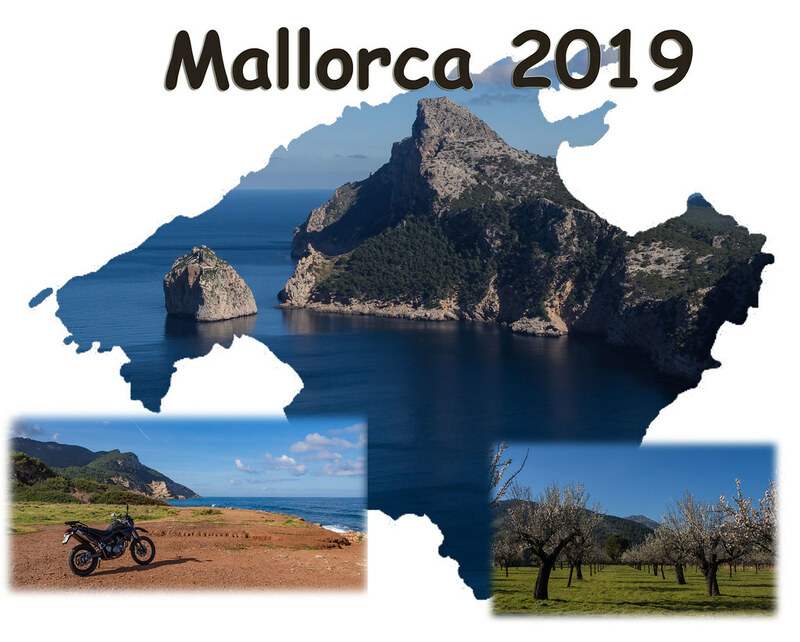 You can drive to Mallorca on your own axis and ferry, but that makes no sense for a one week stay, besides of winter. The island is one great tourist spot. However, despite or because of the Internet, it is not so easy to book something suitable at short time. 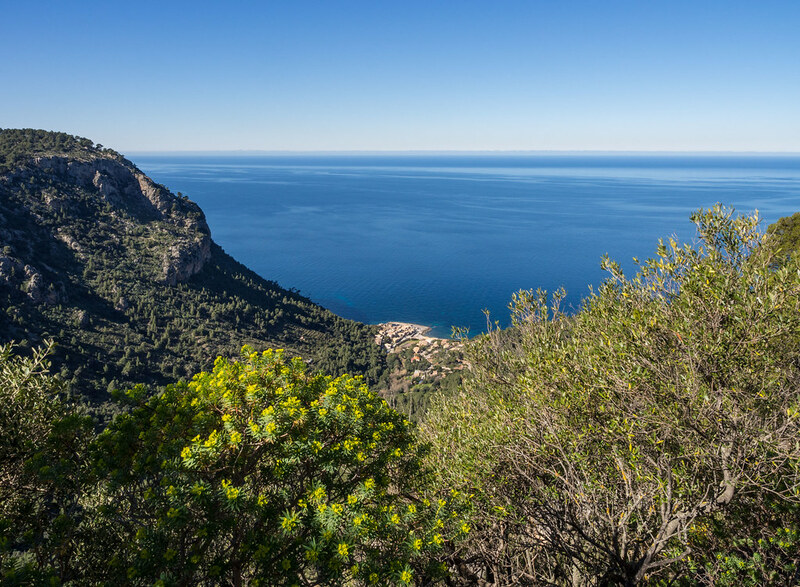 Means, I want to go to Port de Soller, it is centrally located in the mountains, no concrete tourist castles, quiet. 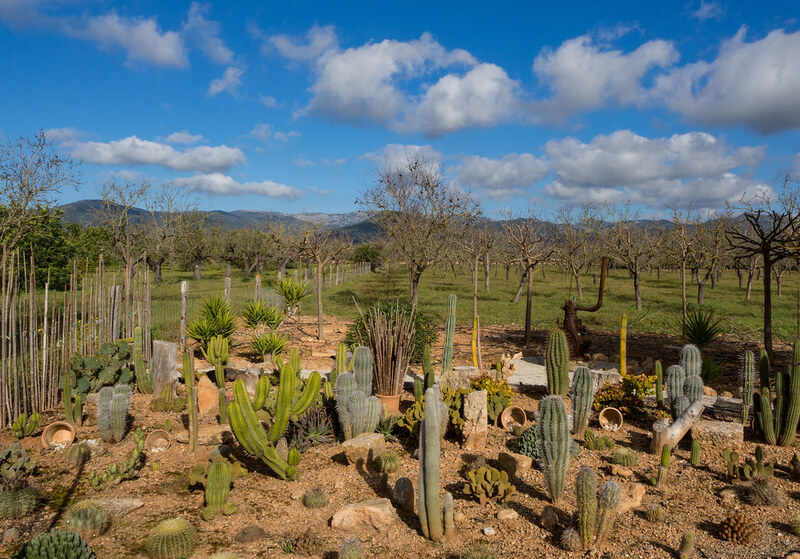 Accommodation relatively cheap, beautiful finca with pool, spa etc. is superfluous in February, if you spend the whole day on the bike, happy if the Sundowner beer goes down faster than the sun. I booked the Hotel Miramar, with a bit stomachache, I could remember, that it was a dump more than 20 years ago. Let us surprise. Renting a motorcycle on Fridays and riding on Monday is not easy either. 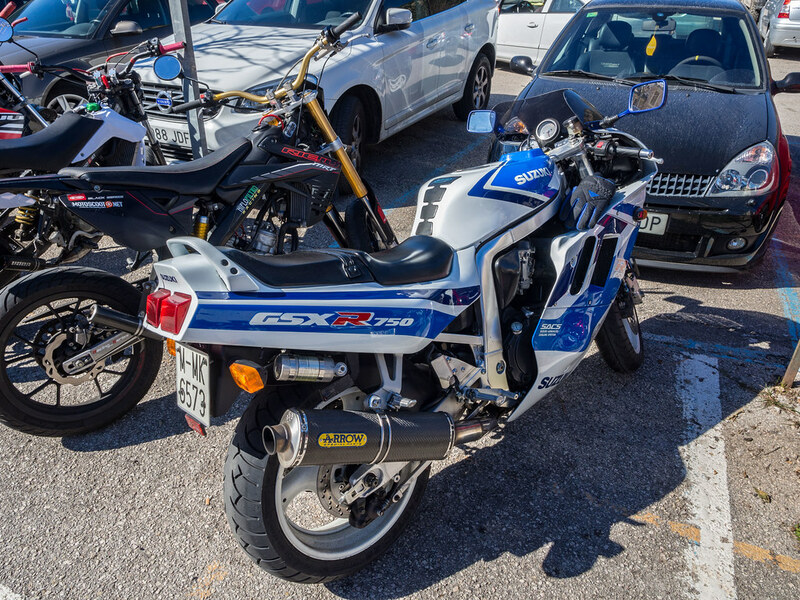 I get one in Palma at Rent Zoom, a Yamaha 660 for 60 EUR / day. Prices like in New Zealand. Plane leaves at 5.50 clock from this city north of Cologne. No one wants to drive me to the airport in the middle of the night, don't now why. Means, the penultimate, for safety reasons, train arrives at 1.30 clock at the airport. In Dubai there are at least sleeping chairs, not there. Countless sleep attempts later, check in, get in, doze in, wake up, get out. 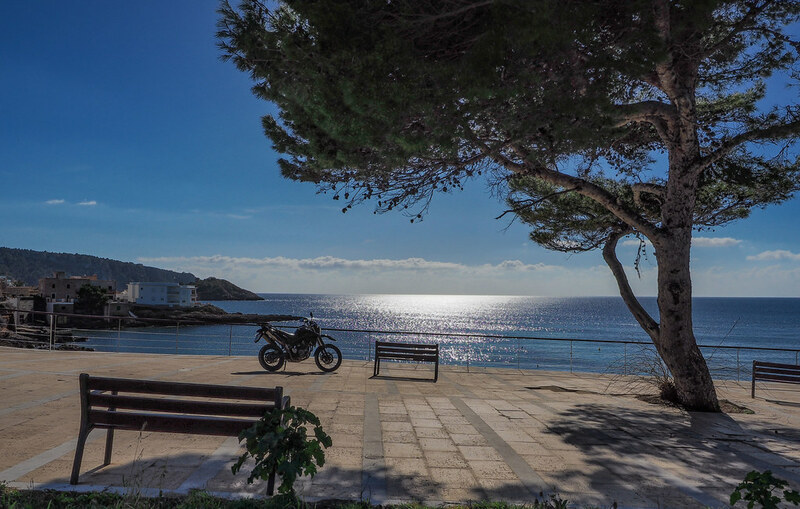 9.30 clock, Palma, call Moto Renta, once shuttle please. The landlord lives on the still orphaned party mile, outside is the black Yamaha. Looks neat, tires are profiled, the brakes brake and the spring elements are dry despite the bar next door. No, that's not the store. The owner speaks German. Nope, have my own clothes with me. A top case? Not in this life. In revenge the top case holder obstructs the luggage transport, the mechanic helps out with a long tensioning belt. I screw on the GPS holder, the kindly landlord quickly install a power connection. Now you could start driving. But a little Japanese engineer was thinking, ignition locks that you can easily turn are boring. Let's build the part so you have to turn it and press the key down. Thanks for that. 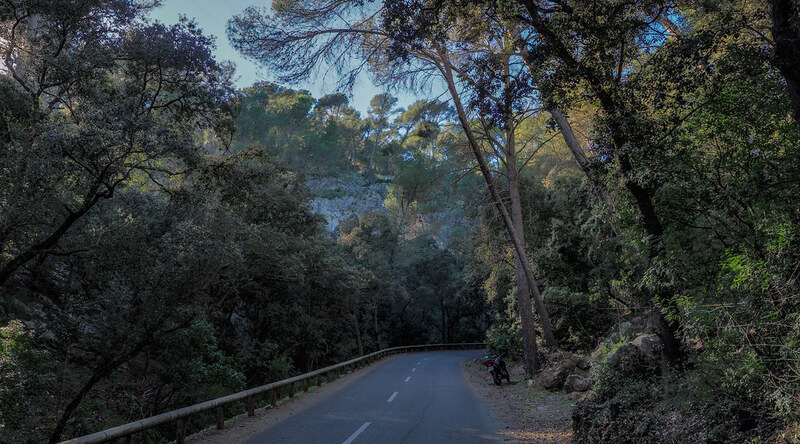 Palma to Soller are about 30 km, not far to the hotel and bed. Maybe I should have switched the GPS better on car mode, which also knows highways. 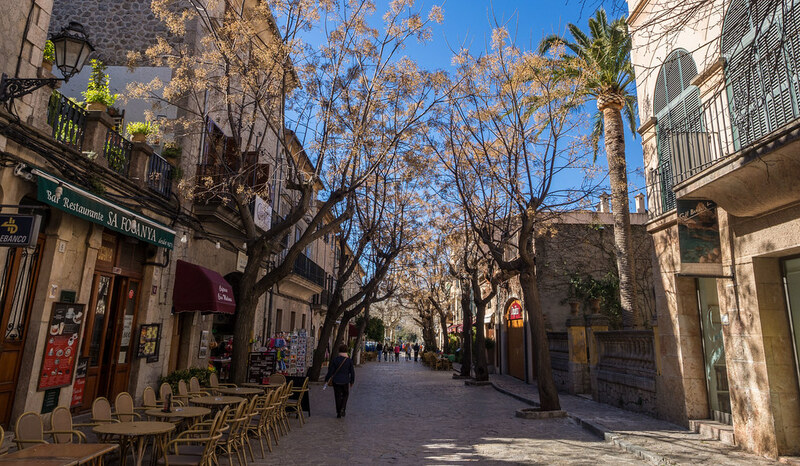 So I drive for practice purposes through Palma, but soon enjoy almond-flowered trees and a long straight direction tunnel to Soller. The hole in the mountain is now free, that's good. 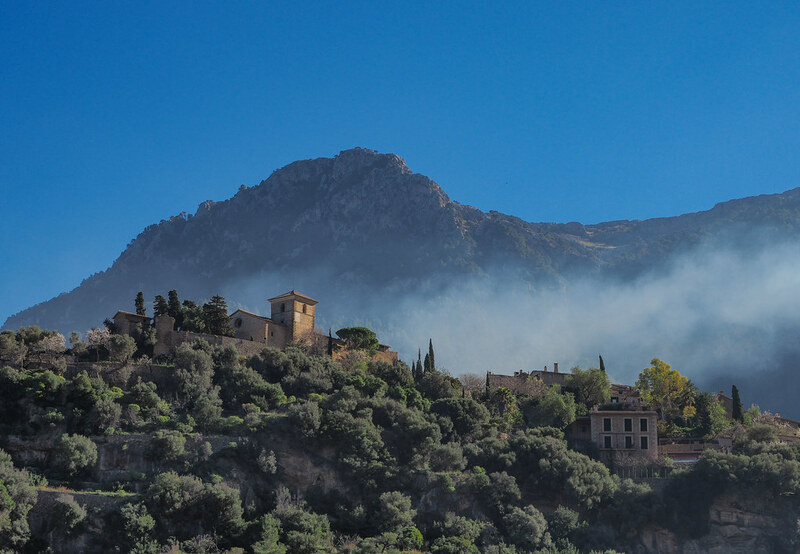 Behind the mountain, the valley of Soller opens and the port is conveniently located on the sea. The hotel is located directly on the promenade. The moto stays in the moto parking lot, also conveniently. Check in again. The twenty-year impression is not confirmed, seems to be freshly renovated. Unpacking, a little nap, a power nap would be good, and then a little drive round the house. When I wake up at 6:00 clock, ok, no round, so the cozy part of the evening is heralded and dedicated to food intake. No problem, one place joins the other. But it is low season, so some have still closed or only open at day for the tourist train visitors. Sometimes is good to have little choices. Good was the quality in the Es Racó D'Es Port. 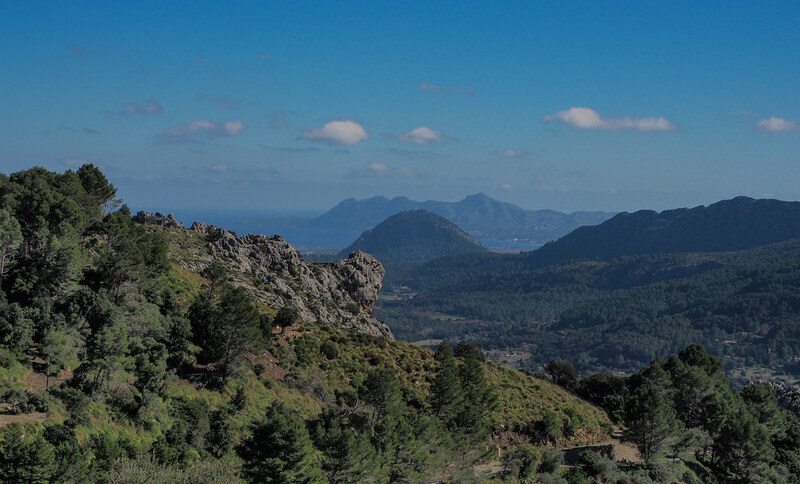 A light down jacket is not a bad choice in winter at Mallorca. Buenas noches. Snapper33, T.S.Zarathustra, B10Dave and 5 others like this. The good thing about fresh night-time temperatures is that you can sleep with no remorse, because pleasant driving temperatures are starting around 10.00 o'clock. Speaking about sleep, in southern countries, the heater is always an issue. In the hotel they had installed a "air conditioning" over the door, which could also supply warm air. 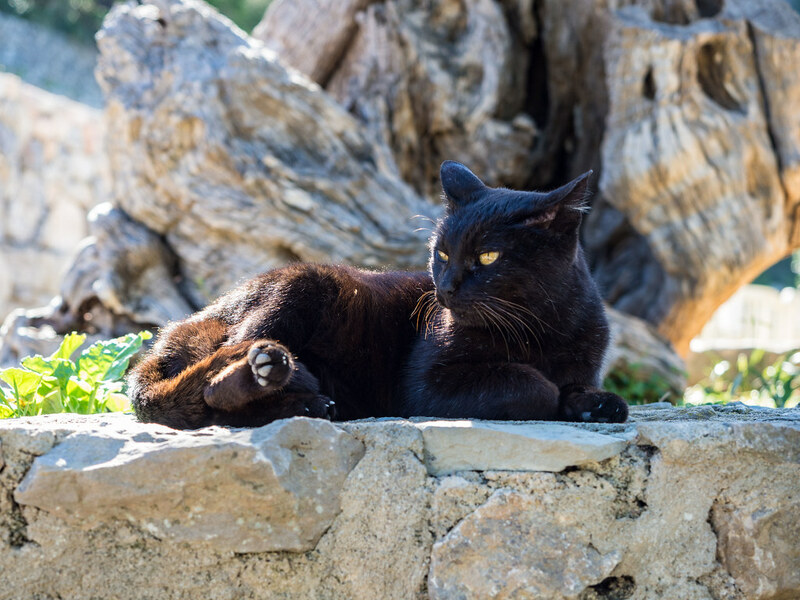 Disadvantage, outgoing air generates noises and that still irregularly, depending on the heat sensation of the control unit, not exactly conducive to sleep. In wise foresight, I had packed my newly acquired sleeping bag liner. In contrast to the rather simple-knit author, the Sea to Summit Expander Liner is flexibly knit. Means, unlike silk, etc., the part is very stretchy, very comfortable. So I previously heated and snuggled into the bag overnight, perfect. Breakfast until 10.30 clock, fits. Quality was ok, the typical, uniform offer in this hotel class, supplemented by warm, "English" sausages, etc. Nothing for me, in the morning only warm drinks, positively the juices did not come from a machine. Nutrient uptake was completed, then dressed up for motorcycling. As an avowed jet helmet fan I take my new bargain Airoh. I like the clear field of view, the advantages of photographing, the food intake is made easier, as the contact with people and at the gas station. Makes me younger too, I hope anyway. In the case of an accident, the protective effect is less, but there is always something. Before departure, the vehicle is inspected again. The 660 engine is no match for sportiness, but this engine seemed a bit more tired. The odometer showed approx. 150.000 km. Ok, with the mileage I would be tired too. But was still a bit strange, because the engine sounded still very healthy. The Resolution: I've looked at the home page, the part is throttled to 34 hp. What the hell, but did not bother me a lot during the week. 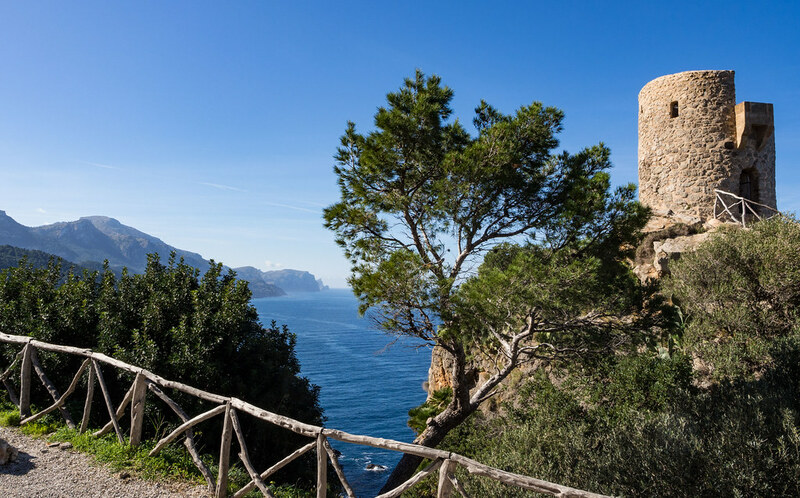 The beauty of Port de Soller, in three directions it starts immediately curvy and hilly. Today is the West's turn. 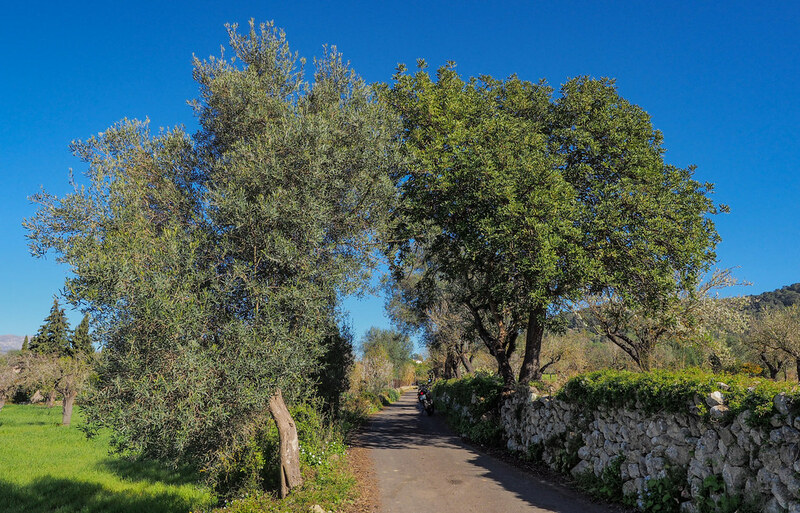 In the morning exuberance and joy over the lack of traffic, I should remember that in the shady curves, the asphalt is still wet. I drive through Deja to my first stop at the port of the Canonge. This must be a holiday, sea from the front, sun from above and mountains in the back. 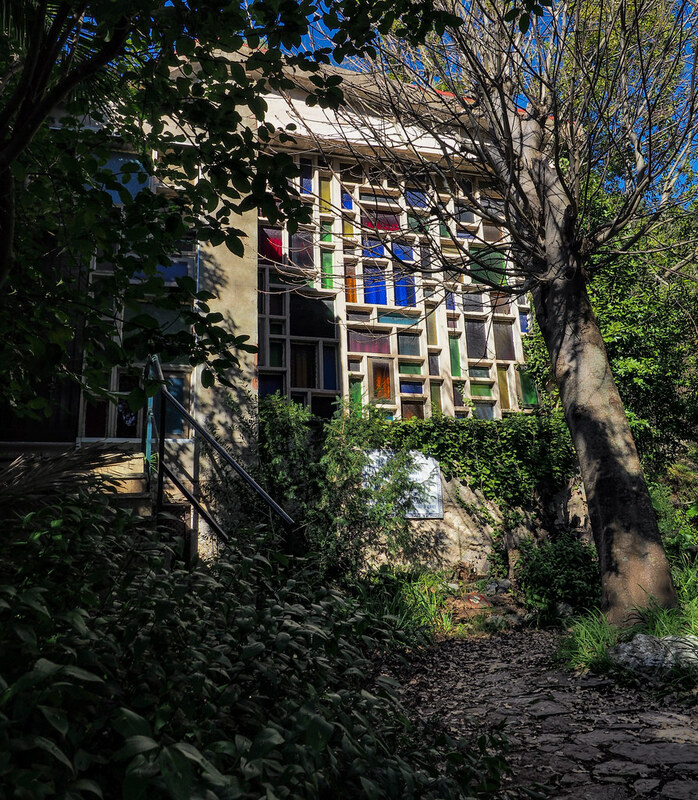 If I get some extra cash, such a cottage in Banyalbufar could not be wrong. 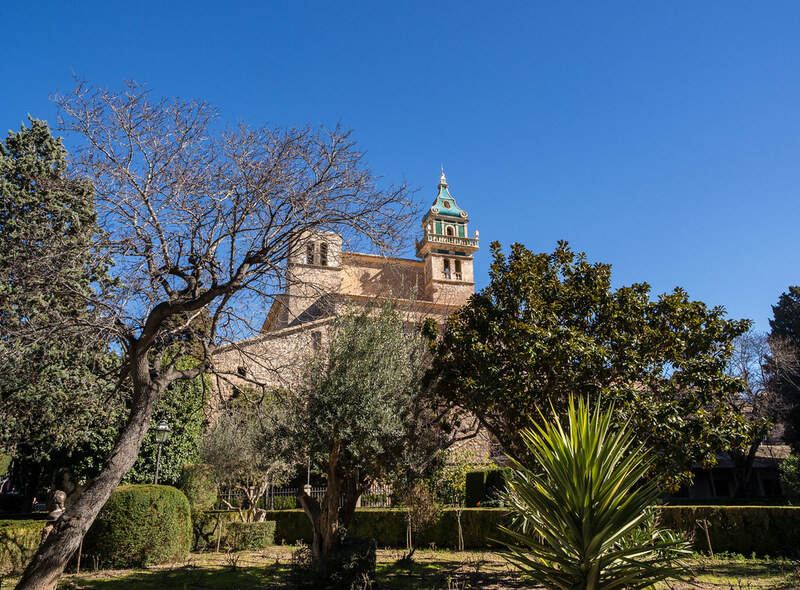 The Torre del Verger is slightly dilapidated and actually closed, but this does not bother some tourists. The tower cat bothers less. 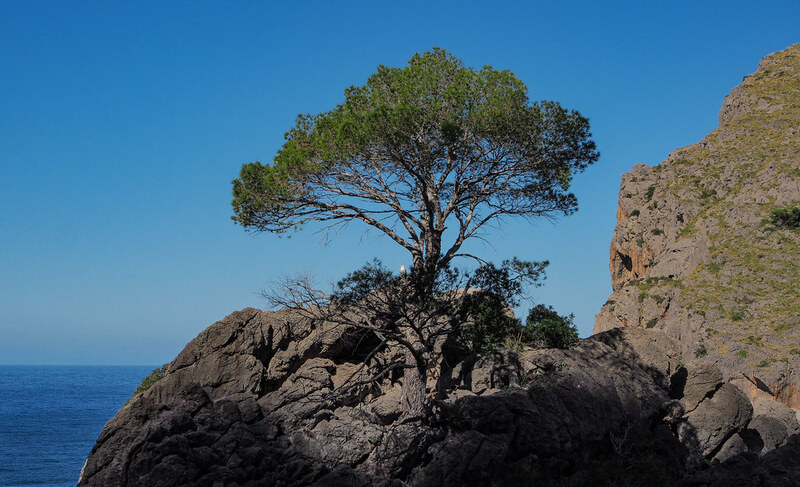 At the Cala de Estellencs everything is still silent. 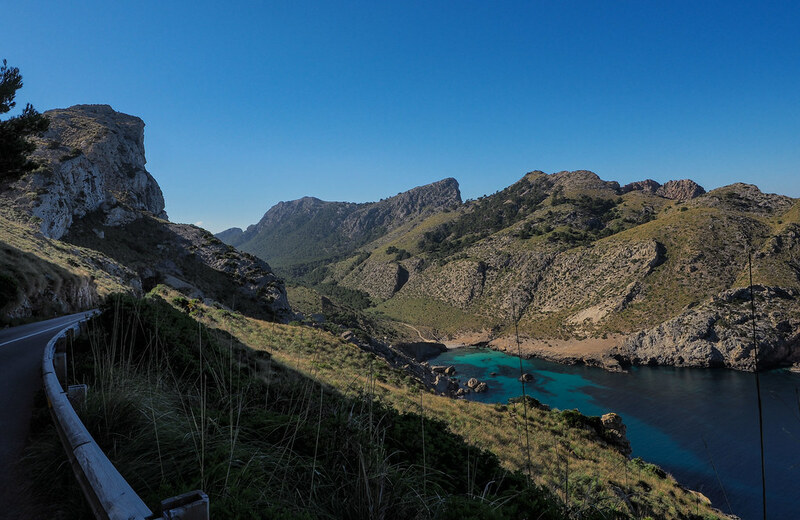 Away from the coastal road, there aren't many side roads, but here is a view of Estellencs and a British long-distance hiker. In the meantime, the sun has also made the damp areas disappear, apparently also the non-existent other road users. 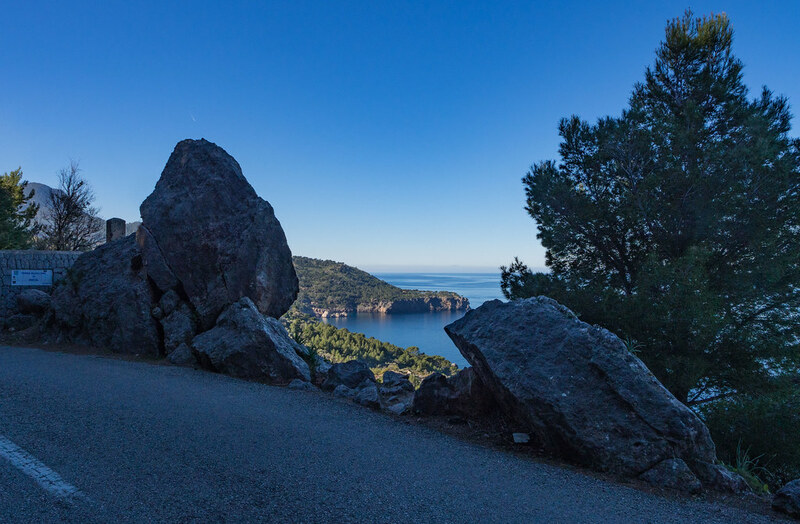 After Andratx, the bend is made towards Sant Elm, the western point of Mallorca, with a view of La Dragonera. 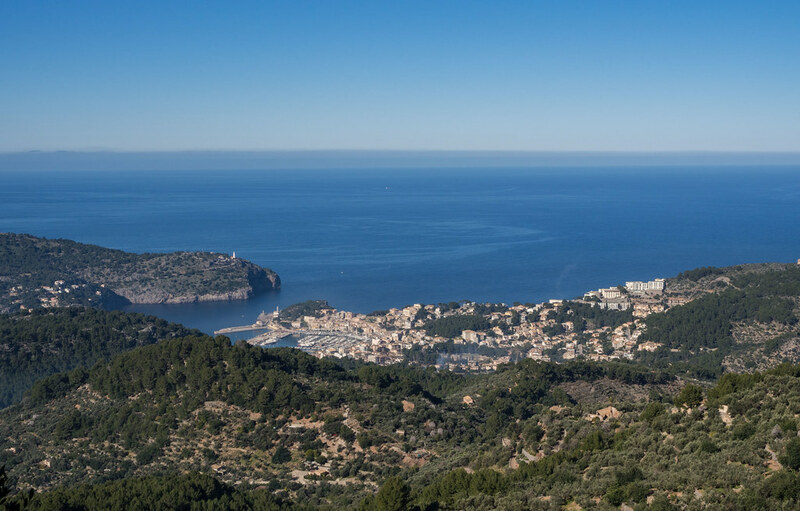 There's nothing going on in Sant Elm, that's worth a longer break. Again the old man and the sea. 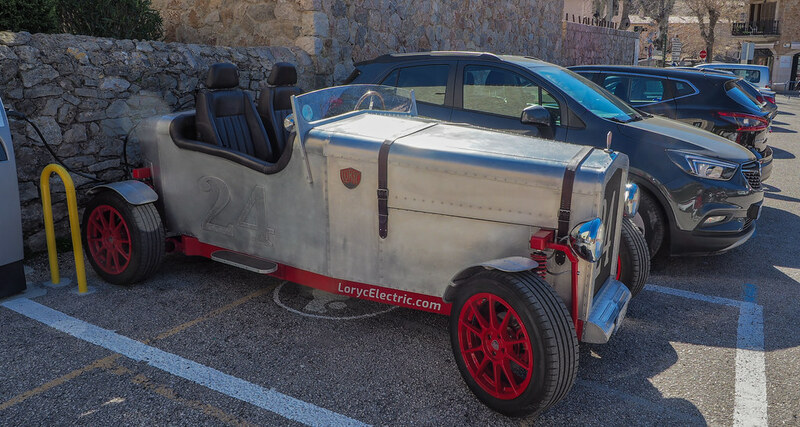 Before this feels like holiday, take off, refuelling in Andratx, the fuel cap is designed like the ignition key, crap. Fortunately, the road builders of the MA 1031 have laid a new little dress over their curves. 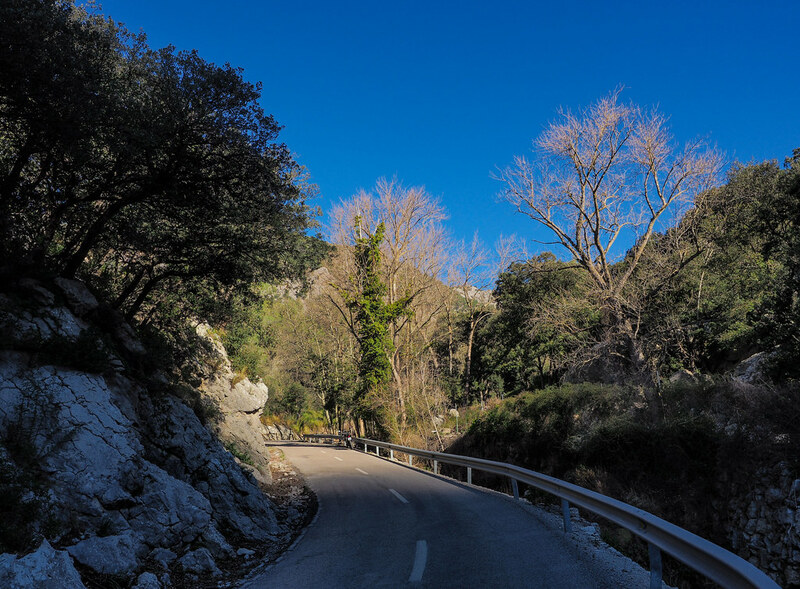 the route to Galilea offers the old surface, but the old curves still inspire. 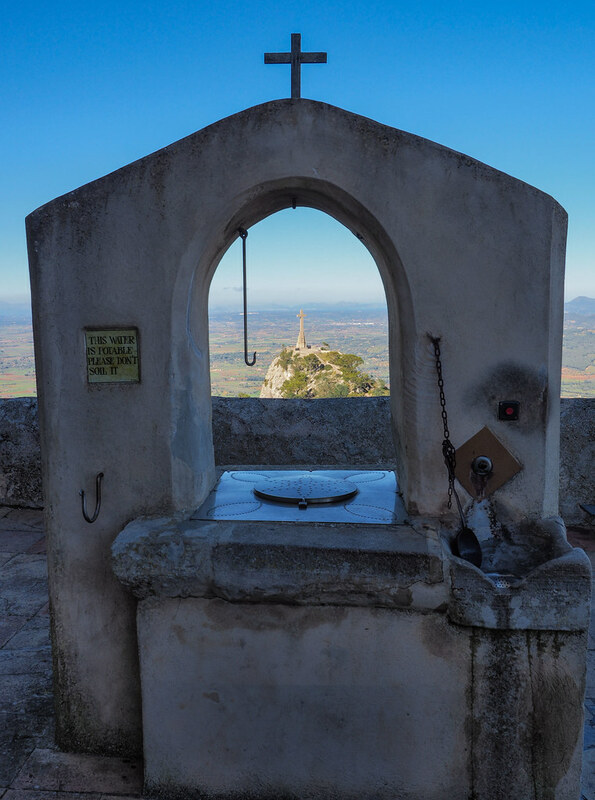 In Galilea, there are always good food and beverages at the top near the church, but apparently not in the middle of a winter week. 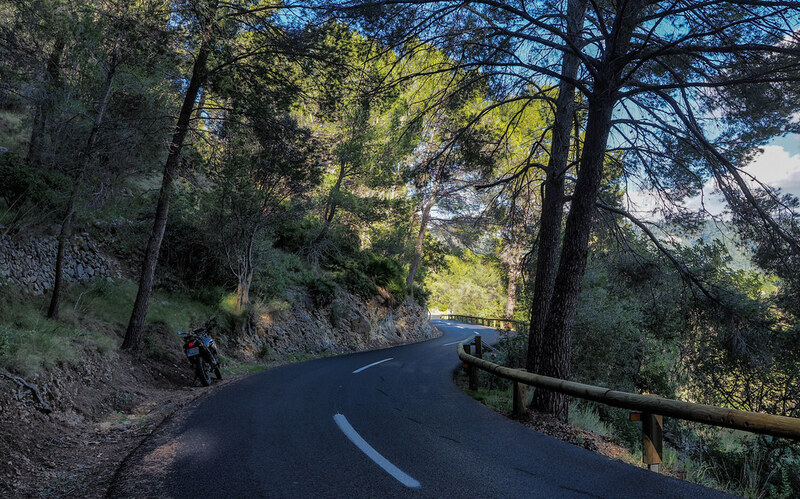 But driving the curves to Puigpunyent makes you dizzy. 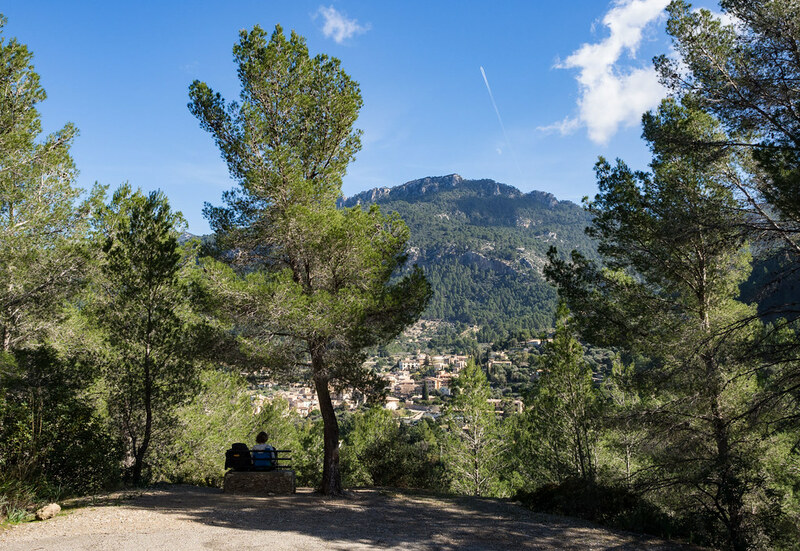 Unfortunately, the Cami is closed at Esporles in the coastal road direction, which gives me a little more km through the valley of Valldemossa, don't complain, before reaching the Sundownder over Soller. Without sun, a San Miguel at the harbour is not so much fun. Showering, some relaxing music through the head and around 7.00 clock the same restaurant as yesterday, again delicious and friendly service. 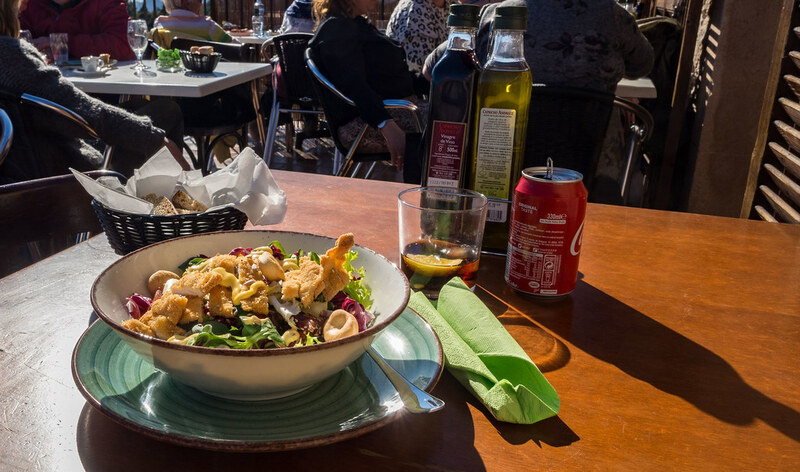 With cerveza or copa de vino, pan de ajo, starter and main course you are always in the price range between 20 to 30 EUR. But eating well on vacation is part of the game. B10Dave, N-Id-Jim, BillUA and 5 others like this. 10.30 clock, an Ironman armor that will dress automatically would be nice, but will probably take a while until it is ready for series production. 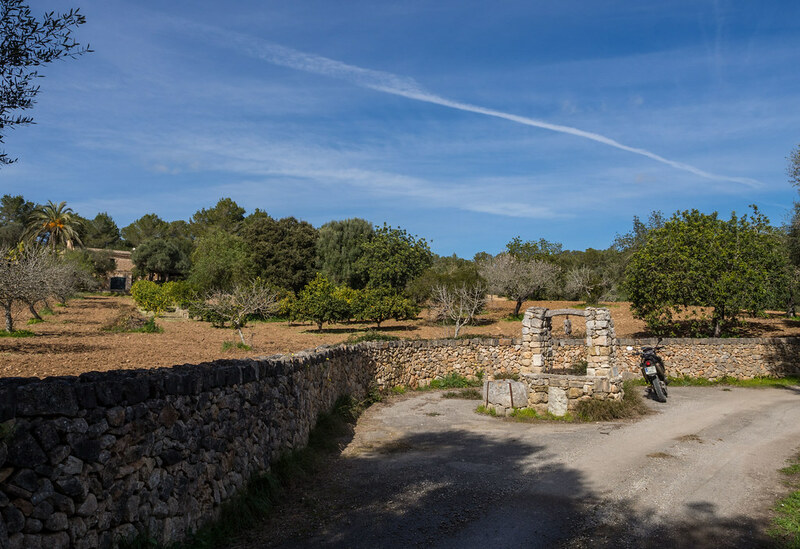 As a reward, the sky is blue again, the Yamaha starts and on the small, fine side line MA 2124 I'm heading to the driveway to the Puig Major. 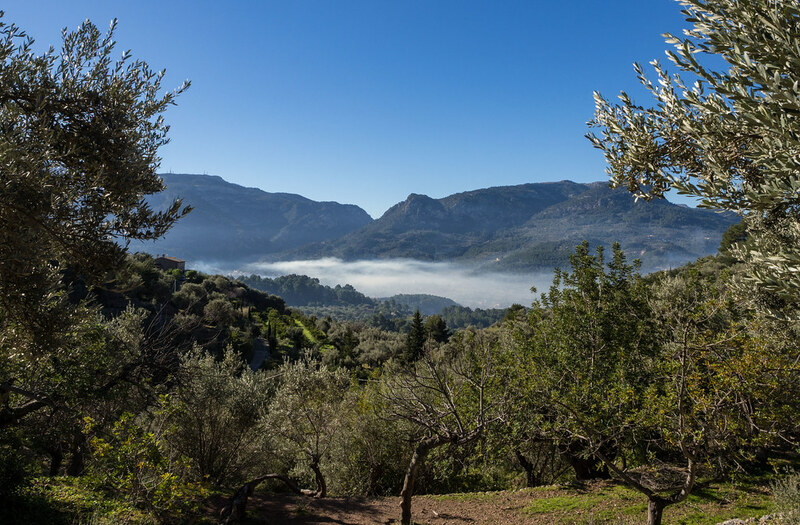 The fog slowly dissolves over the valley of Soller. The cause of the fog does not seem to be quite clear, because next to me hold's a Benz convertible, an elderly lady speaks to me in English, I should please report that the fog is not natural, but from house fire or other sources of fire. Did not seem to be amused about it. 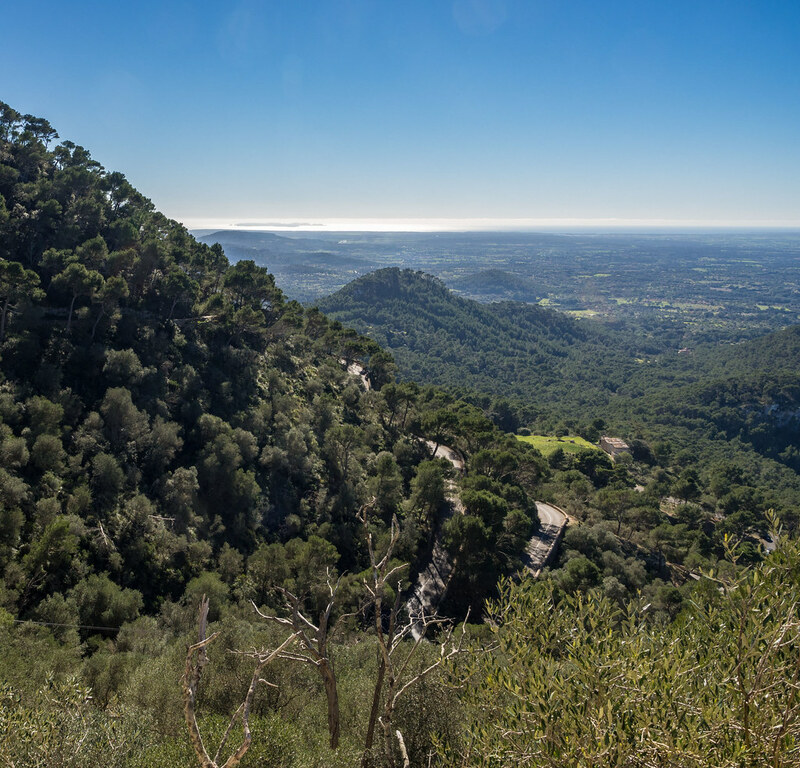 later reached the Mirador de ses Barques. 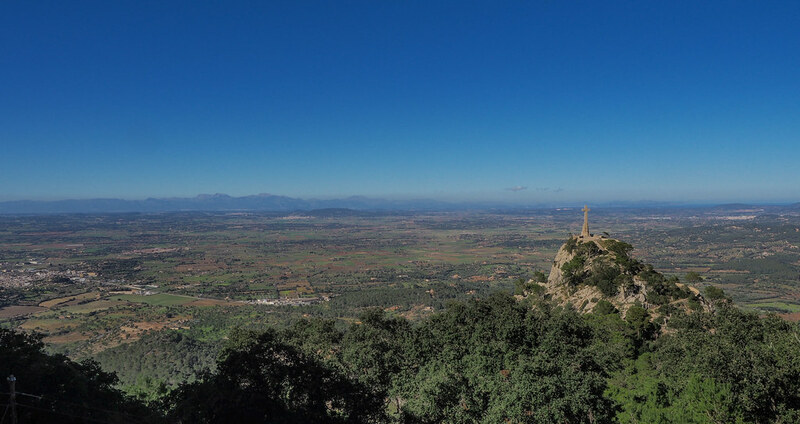 In Spain Mirador stands for a view point, in this case on my vacation spot. The well-developed track attracts the race faction, the Mirador seems to be the applause curve. 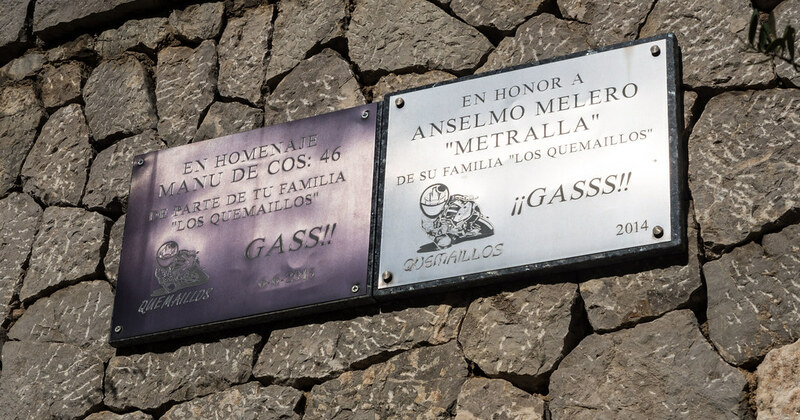 Something which is quickly banned in Germany, plaques are placed in Spain, for those who do not race anymore. 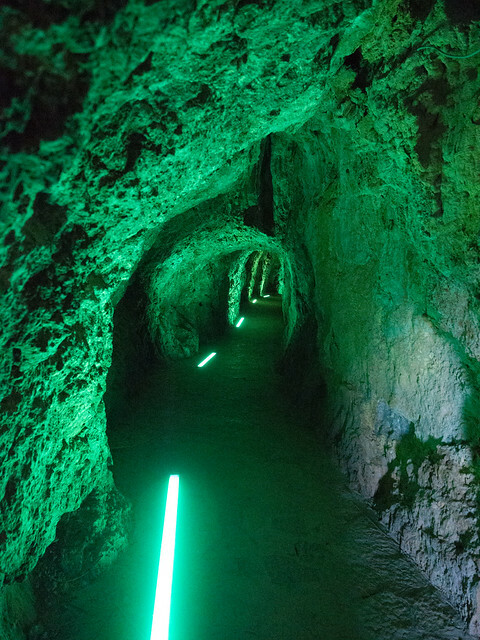 The big rock needs a big tunnel, for motorless two-wheelers, I recommend reasonable lights. 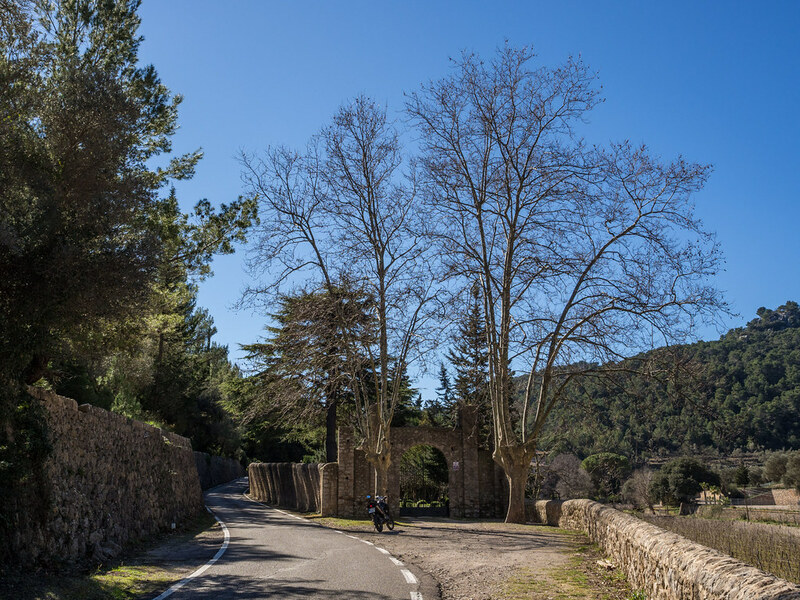 A few curves and meters later, you reach the Embalse de Cuber. 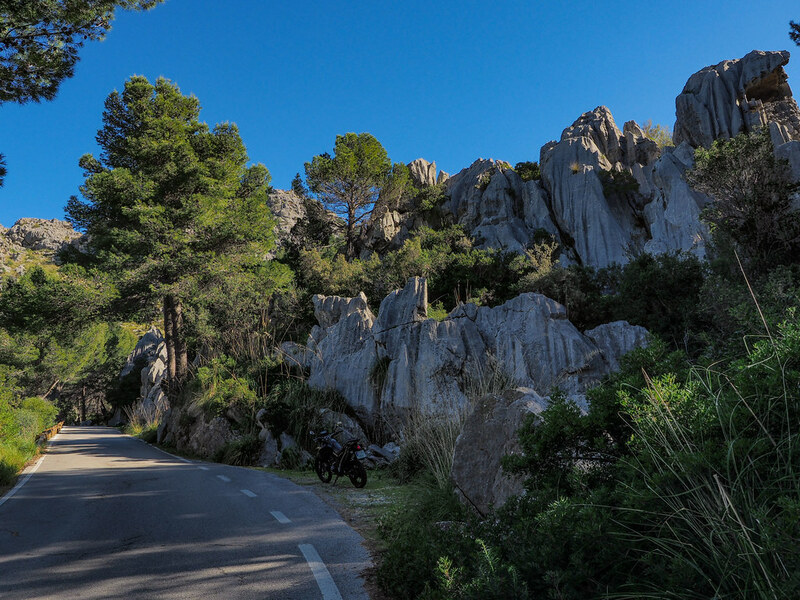 At the eastern end there are parking lots for excursion and hikers, lazy bikers do only a few hundred meters today. Years ago, things were different. 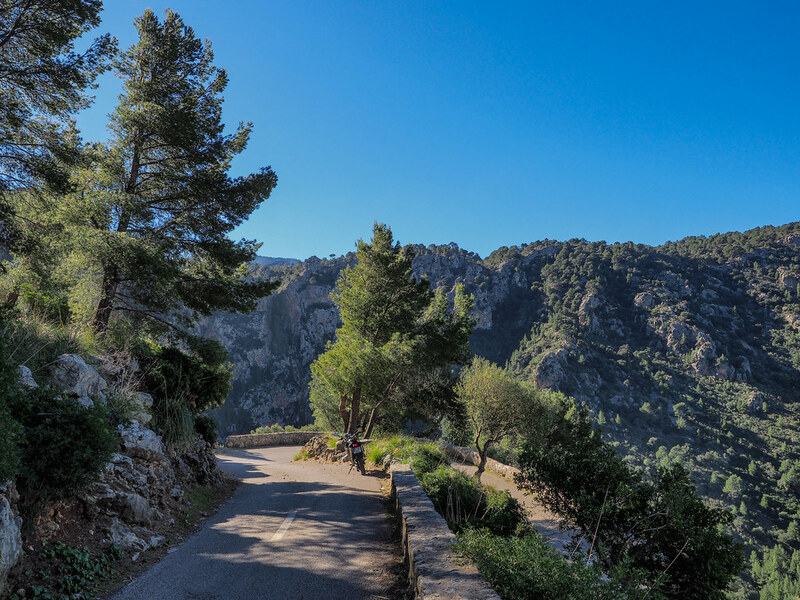 A beautiful path leads past the lake, which winds down to Soller after few small intermediate paved slopes. How do you recognize the difference between English and German hikers? Some call "go for it", the other are not amused. Back to the present, the military has settled on the Puig Major. the driveway to the peak is impassable and closed. 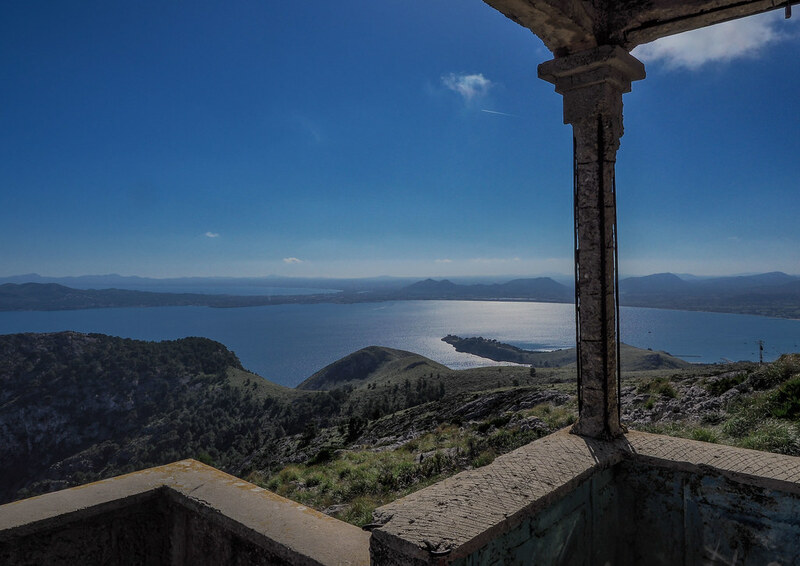 Continue along the plateau to the Embalse de Gorg Blau. followed by the next tunnel and soon the destination for today is reached, the Coll dels Reis. Who? 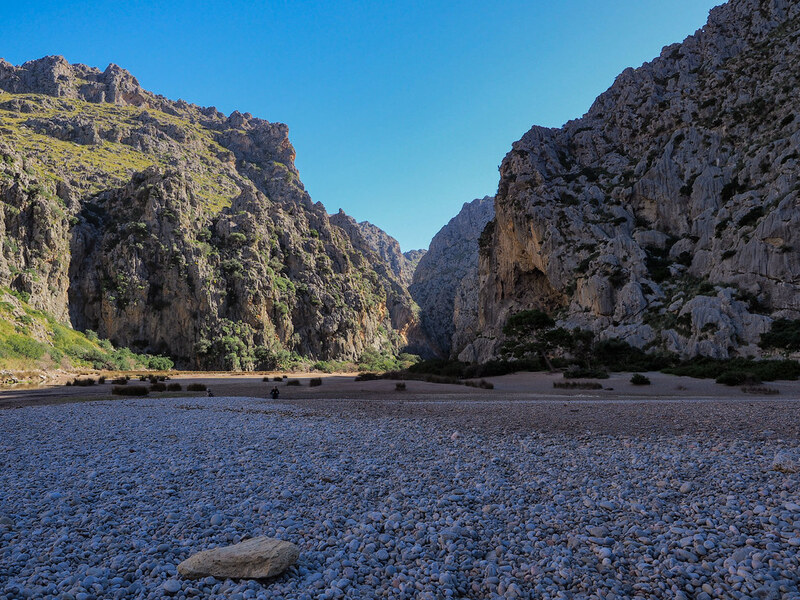 Better known under the name Sa Calobra, the destination of the gorge and the road. At the Coll, the little house is closed, almost no cars in the parking lot, buses are not on the road and only a few "strayed" racing cyclists. Perfect. curves of any radius are an offer, 700 Hm just fun, compete with any Alpine pass. At the end point the sea and a big gorge wait. There is also one restaurant open, no crowds of other tourist. 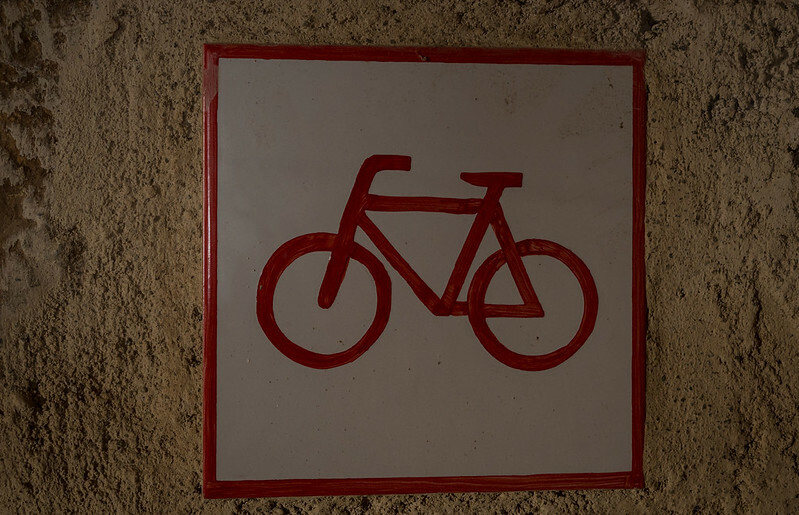 "Higher" people could use a helmet passing the tunnel access. The ratio of visitors to pebbles is pleasing low. 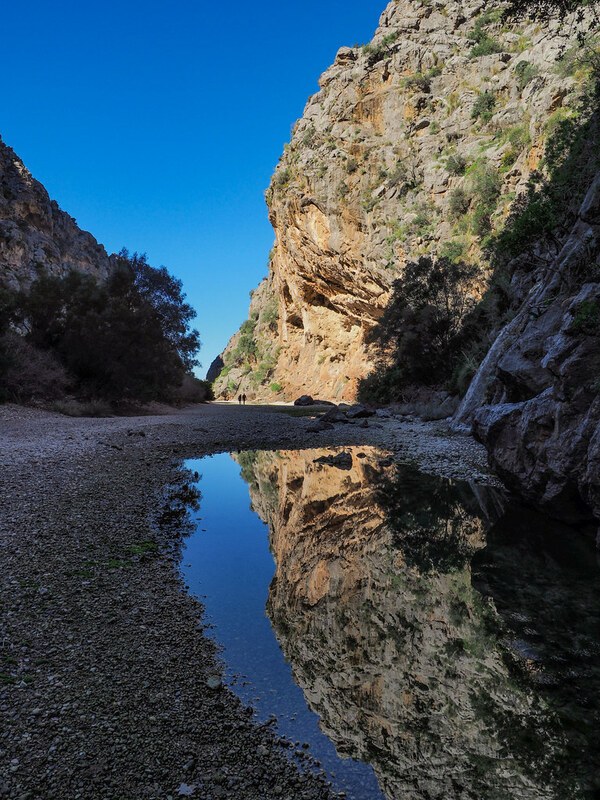 It is worthwhile to follow the gorge a few hundred meters. The way back, pleasing free of obstacles, on a narrow route. A compliment to the street builder . The further stretch through the mountains is in the shade and the temperature has trouble to remove the moisture. But this homeowner has difficulties with water procurement. 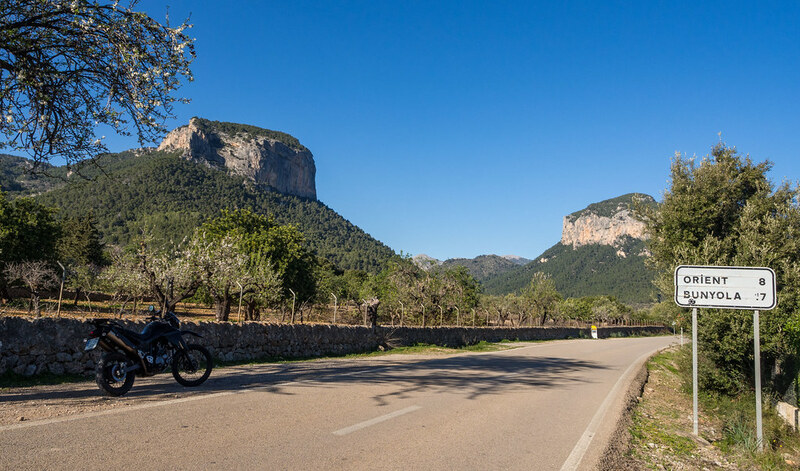 I reach the junction to the monastery of Luc, decide to go south, filling at the only gas station on the coastal road the vehicle and the rider and elated into the Mallorcan lowlands. 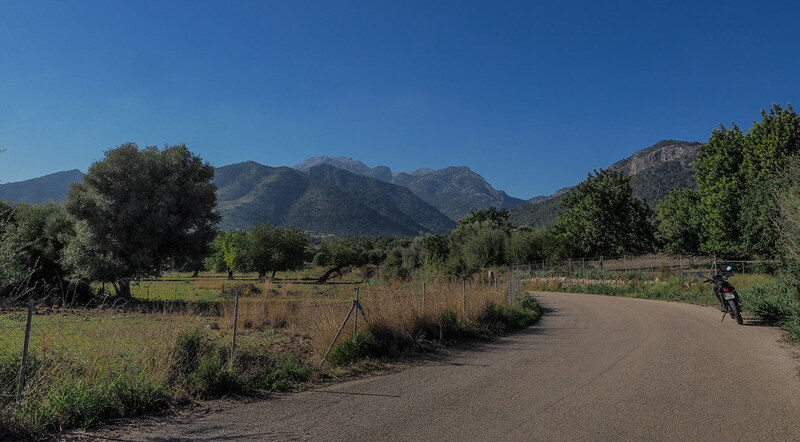 At the foot of the mountain, the old Cami have been upgraded to paved "cycle lanes", also ideal for leisurely motorcycling. In February the sheeps are blooming and grazing the trees, or the other way around. A fast ride through the Orient, so today no pictures. 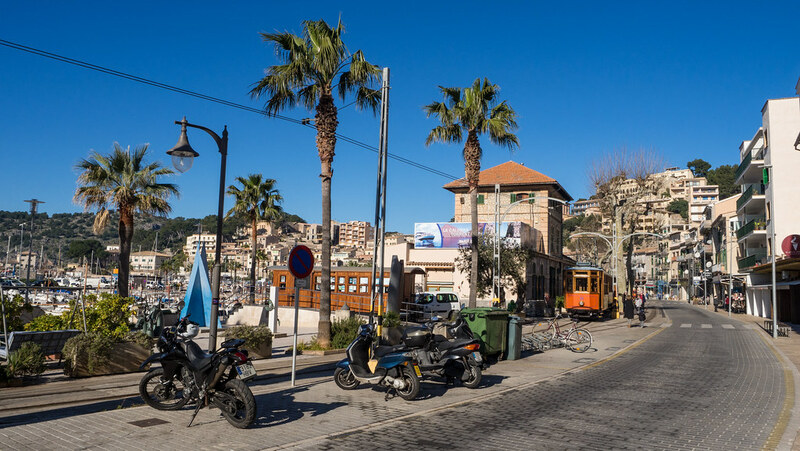 home to the beer at Port de Soller. At El Pirata, the evening turns to wine and seafood. Had worse birthdays. B10Dave, BillUA, popscycle and 4 others like this. 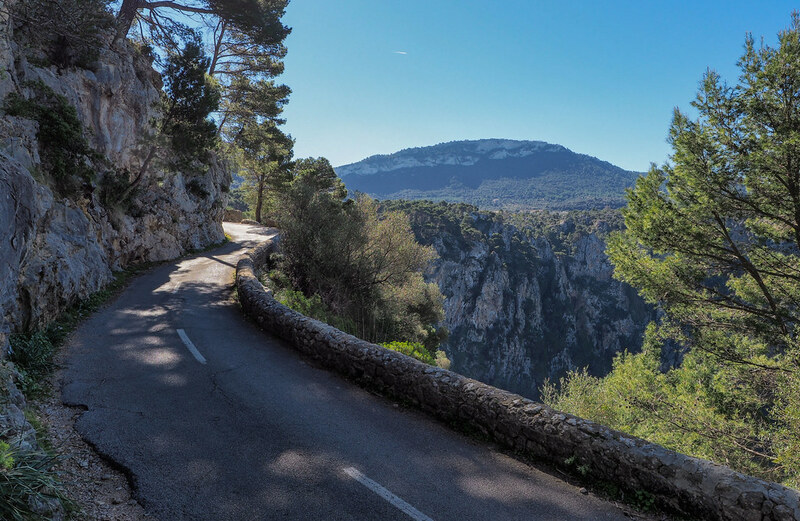 If the road cyclist wants a challenge, he will drive the 90 km from Port de Soller to Cap de Formentor and back. I am afraid my shape is too bad today, I better take the Yamaha. 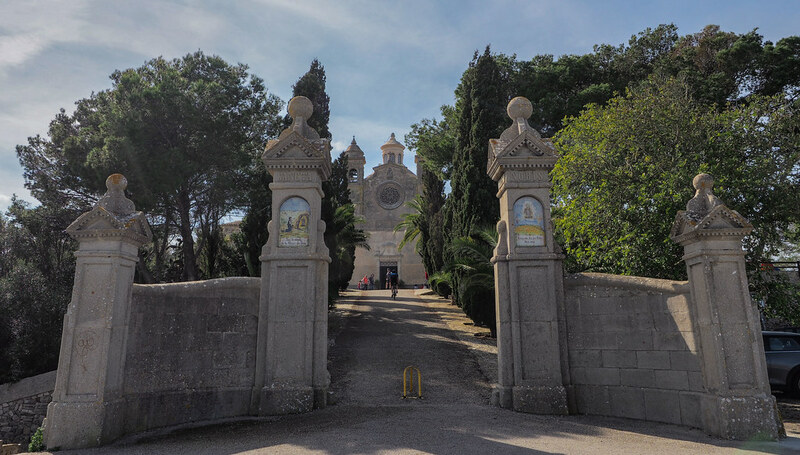 The way to the stopover at the monastery Luc is known from yesterday and was driven in one rush. 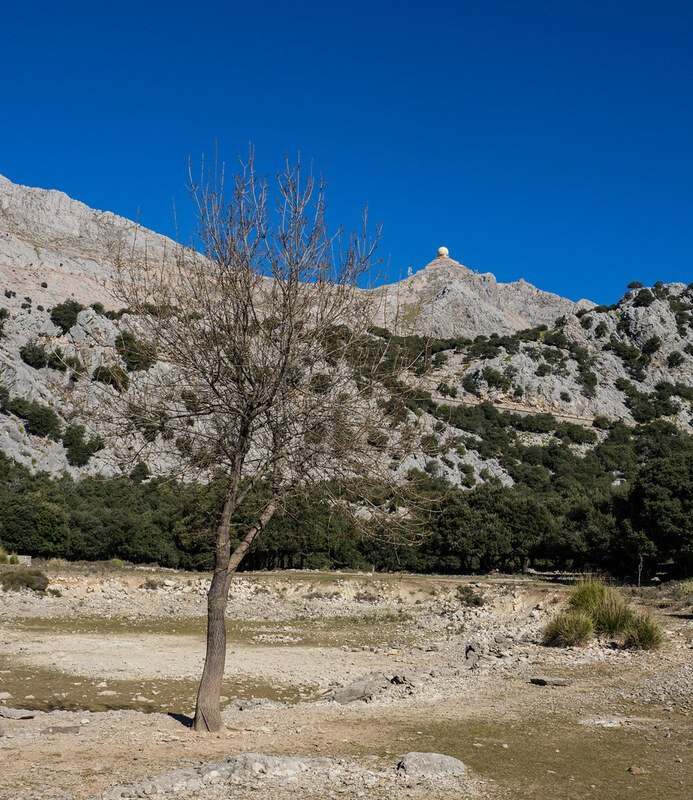 The location of the monastery fulfilled all the features, far from all, quiet and without other distractions. and apart from the day visitors you can live there and accommodate your traveling companion, but the rooms are very simple. 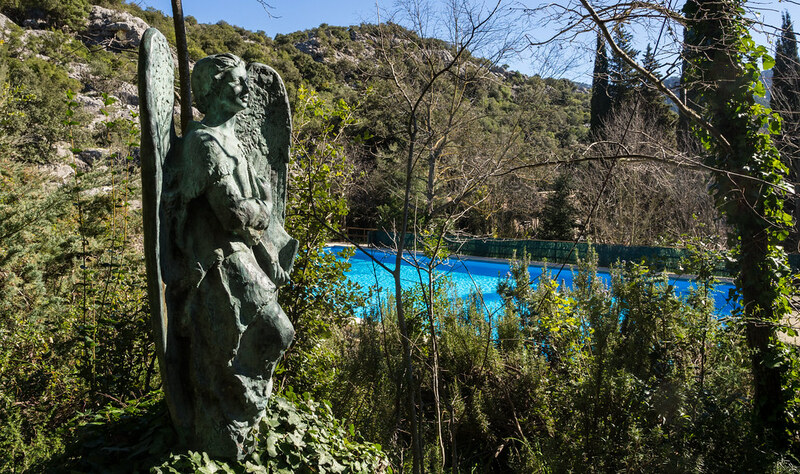 At least one pool with heavenly lifeguards. 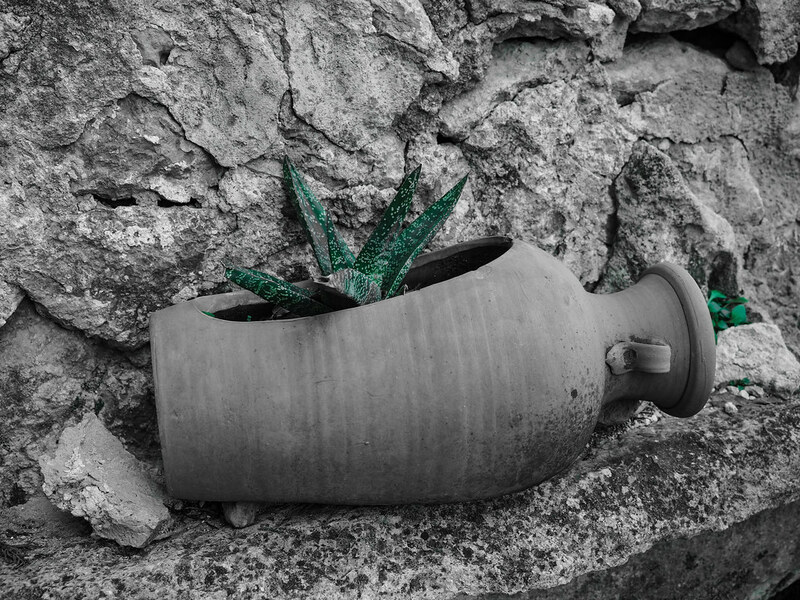 I do not have a green thumb and already have a place to stay, so I head eastwards. 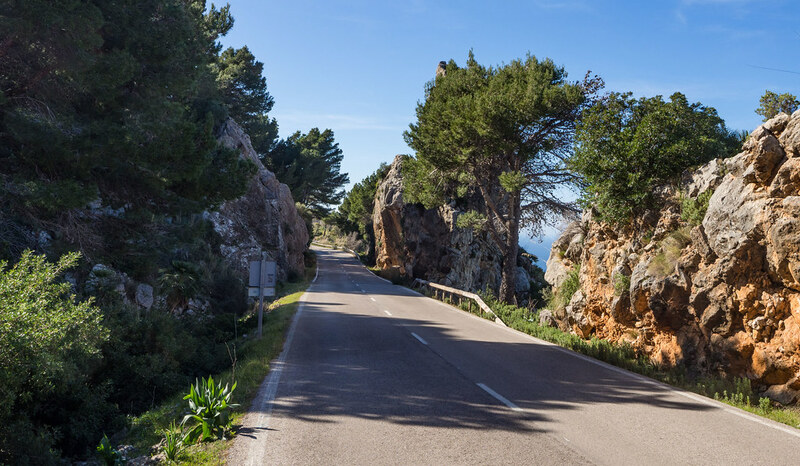 Just before the bay of Pollenca, the driving fun stops and a few minutes straight follow up the turns to the Coll Antonio Parietti and Mirador des Colomer. 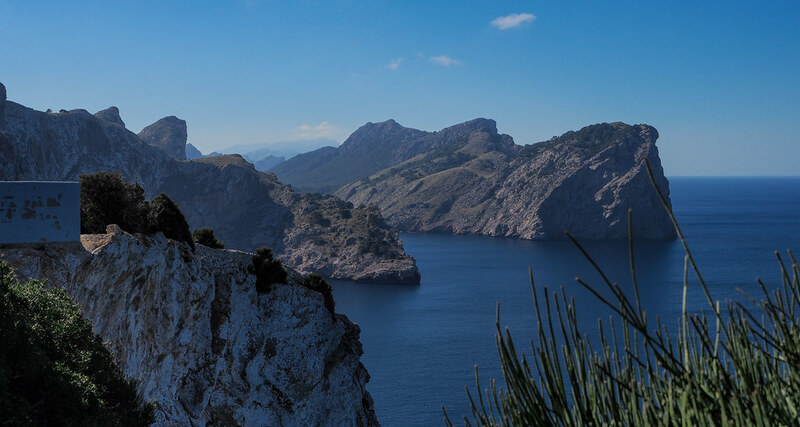 The viewing platforms are located on a rock spur, down to the water surface it should be so 200 m.
You have a first view towards Cap Formentor, but for better view climb the road opposite the Coll to the Talaia dAlberutx. Too bad the cottage is a bit in need of renovation. The rest of the way to the Cap is also formentoble. and the way back offers always different prospects. 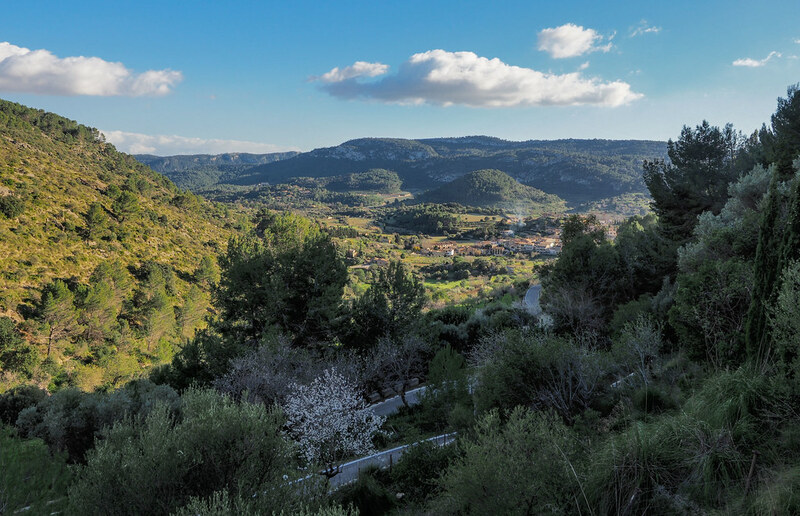 Take the second exit at the last roundabout in Pollenca, switch OFF all main roads and ON the shortest route in the GPS. 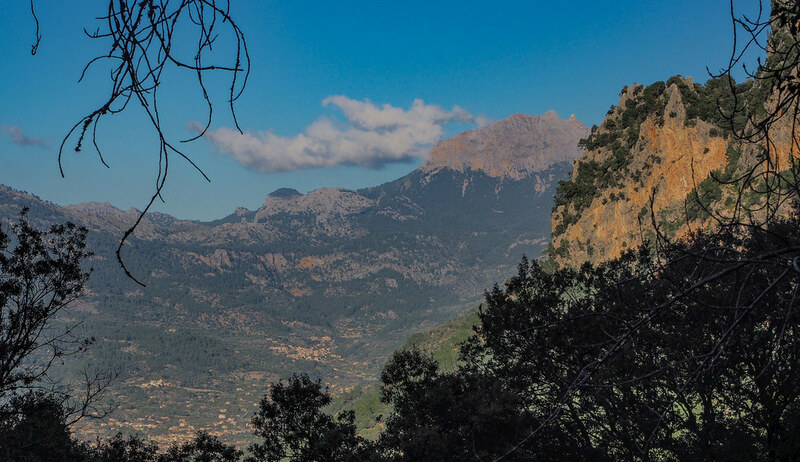 It takes you at the edge of the Tramuntana mountains following the little Cami. or brutally exposed under the sun. Again the very popular almond trees. or it does not look so oriental. The Orient is known to be a little bit bigger .... Endspurt. At the end of the day, as always, the local criticism. I wanted to be a little more economical and visited the pizzeria Roma. Pizza ok, beer selection good. The garlic sauce was probably carried only along the tuber and the lemon cream only leads to a sour burp. klaviator, B10Dave, BillUA and 2 others like this. 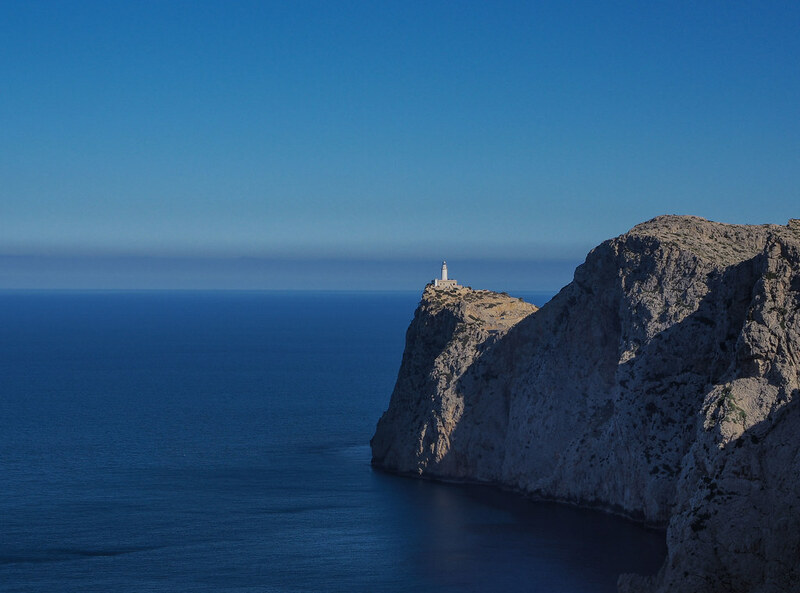 A little paradise hidden in the mediterranean sea! Thank You for this ride report and your fine pictures. In 2012 the Yamaha still had all 48 pony's ... must have lost some the during last 7 years . 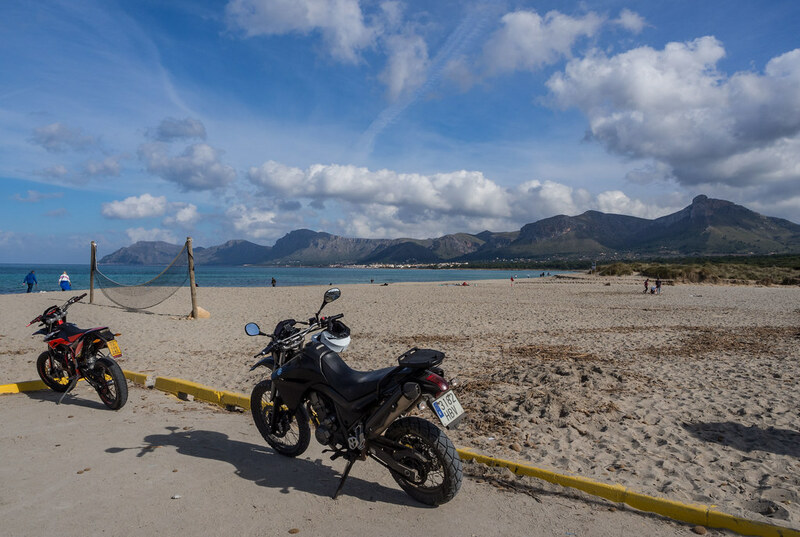 In 2012 this bike had approximately 48.000 Km and performed very well. 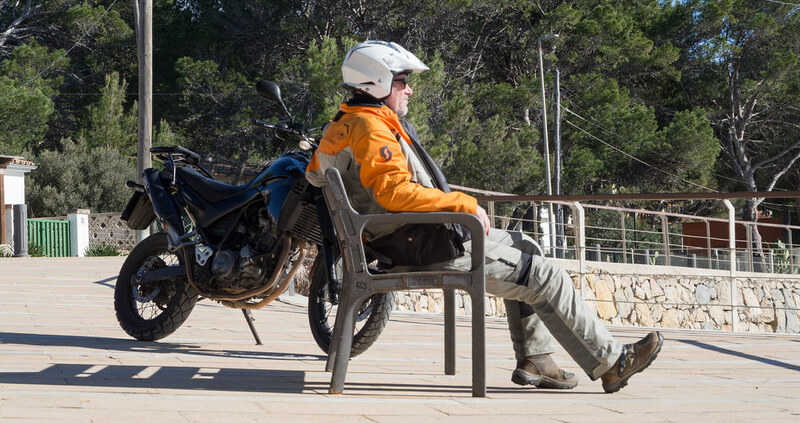 Thanks for the "old" comparsion, the XT 660 is a reliable bike, so many different riders, so many Kilometers. 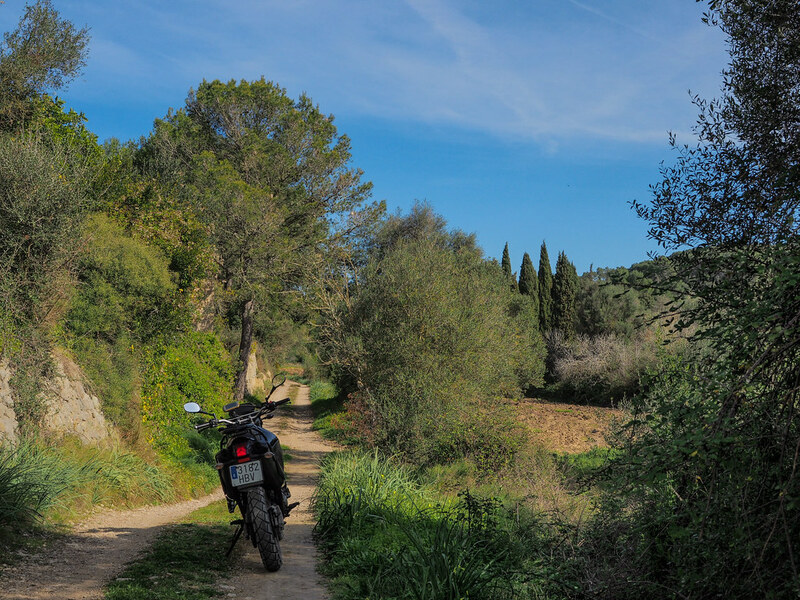 Again holiday stress, again motorcycling. 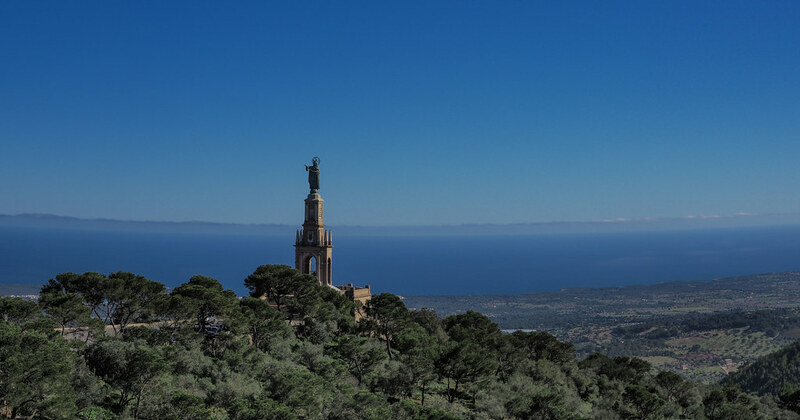 Or with the old Siemens tourist train to Palma and a city tour? No, not. Although, everyone should buy a train ticket once, the ride through the mountains is beautiful and has a lot of nostalgic flair. 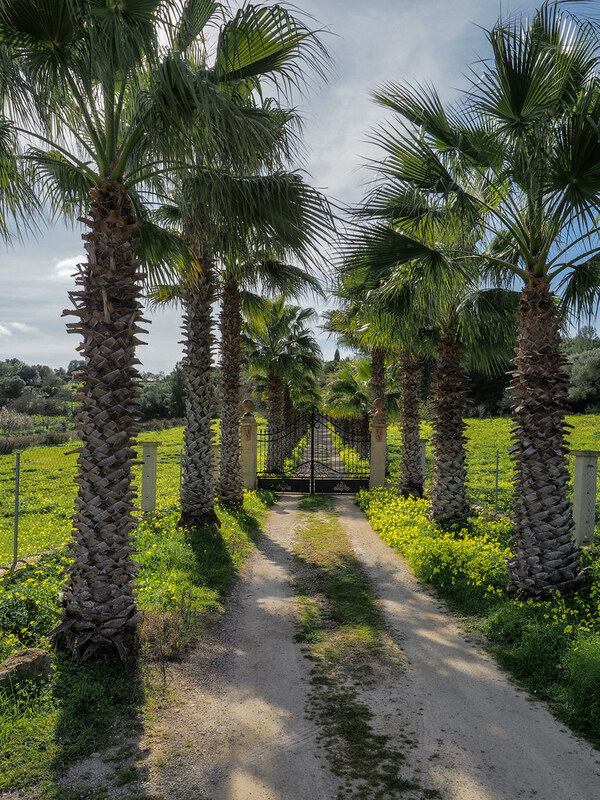 The center of the island has its charms, already been documented, today no difference. 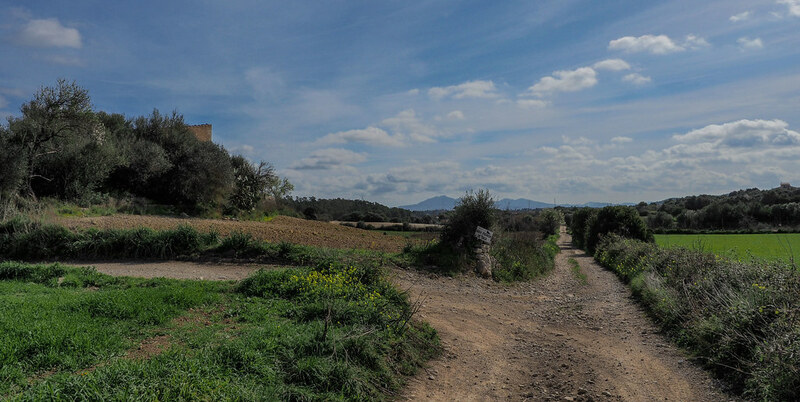 On the way to Puig Magdalena. 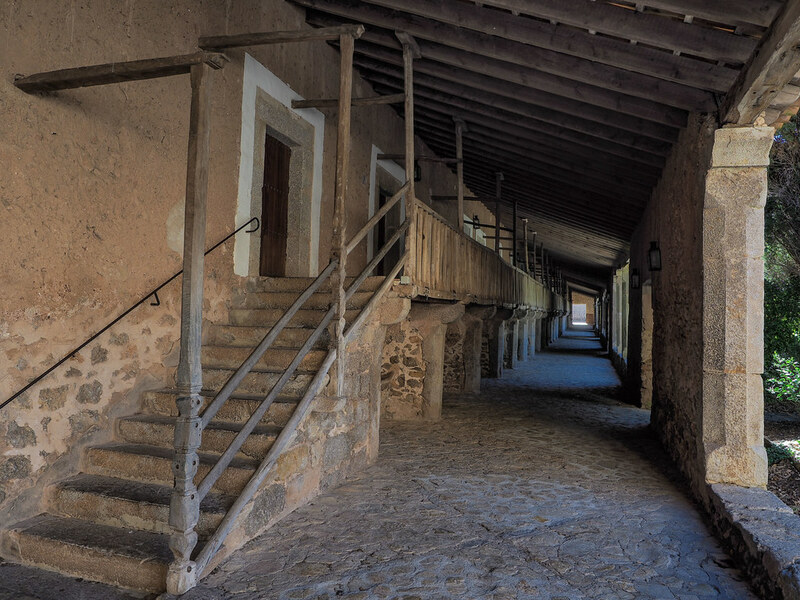 Peace and silence are gone, plenty of small Spaniards make the area unsafe. At the top there is a good restaurant, next time. I continue to the next highlight. From the net I had a quad tour in the area on the GPS, so the sometimes winding course. The tracks all looked good, but seemed too grainy for my front tire to have fun, next time more knobbies. I prefer to stay with the small, asphalt Cami. 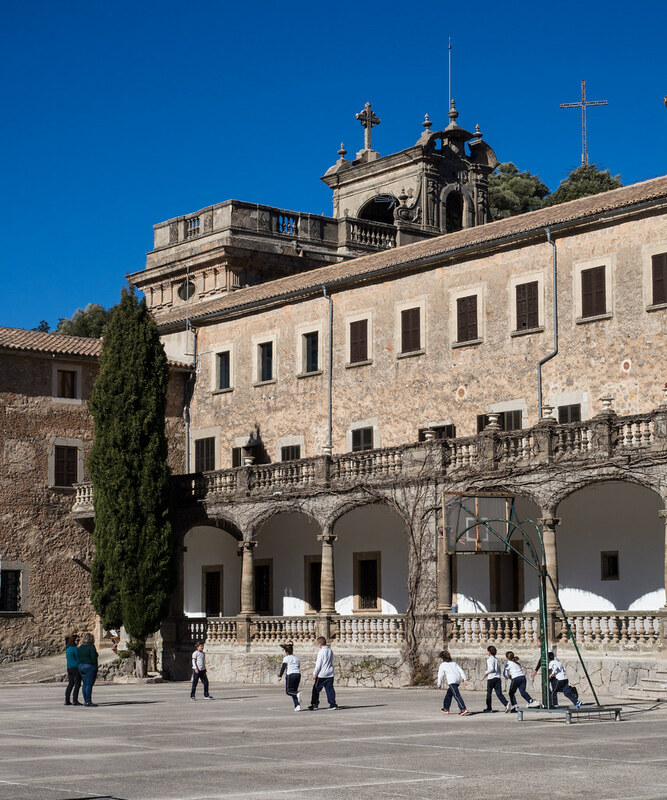 Except Oranges, there is also an interesting museum here https://www.mallorca-experte.net/els-calderers/ , which closes in the winter at 16.00 clock. The next "tower" in view. 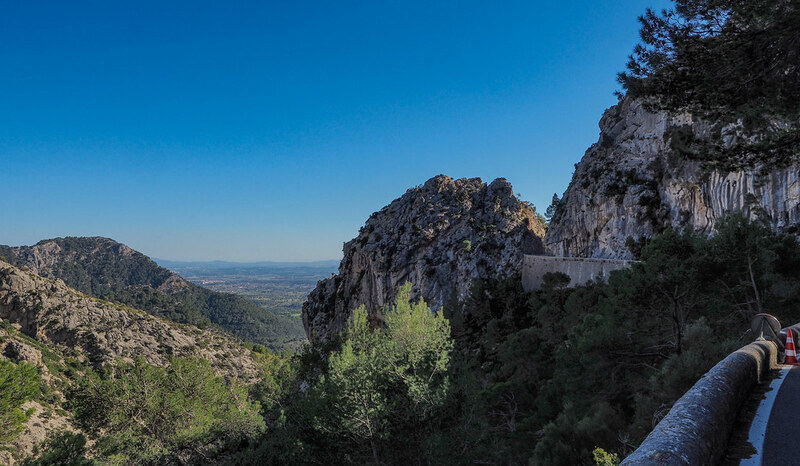 Later this year, this is the holly mountain of cyclists. In the south it is not far to the sea. I'll take a break and then head for the descent. The way back brings me a few bad roads, such a hassle. 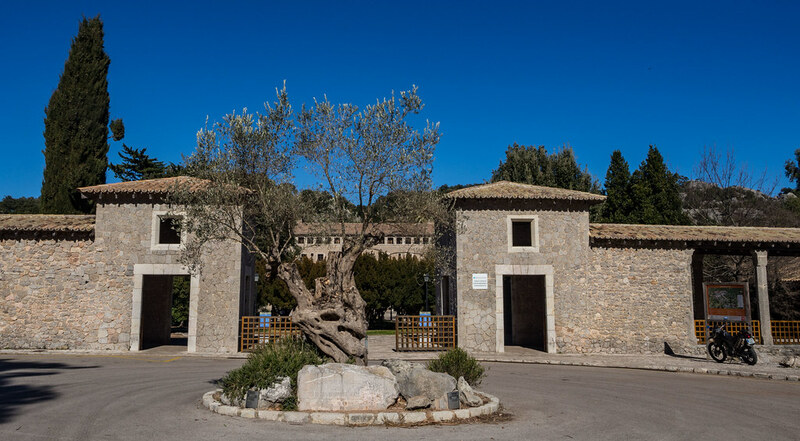 Actually, there should be three "towers" today, but Randa https://www.mallorcaexperten.de/kloster-randa was a victim of my bad time management or the appointment with Mr. San Miguel at the home port. 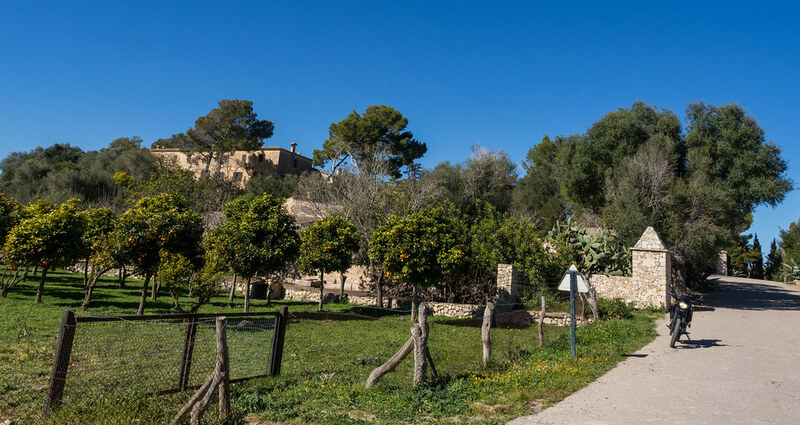 The fourth would have been the Castell Alaro https://www.mallorca-experte.net/castell-d-alaro/ . Highly recommended, but only in light hiking clothes. In the evening there were no experiments and I went again into the hands of pirates. eaglescan, klaviator and KneeDrachen like this. Today a relaxed round through the west. 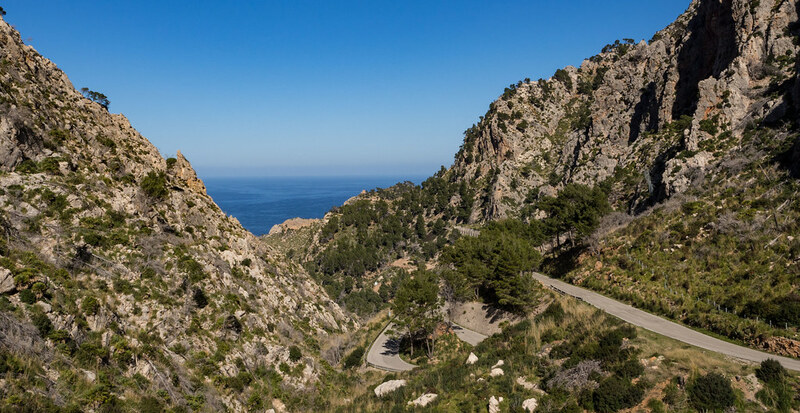 It is better to stay at the coastal road, a long way down or hard rocks are bad alternatives. in Deja burning wood or only the morning fog? but nothing for beginners or height-anxious riders. 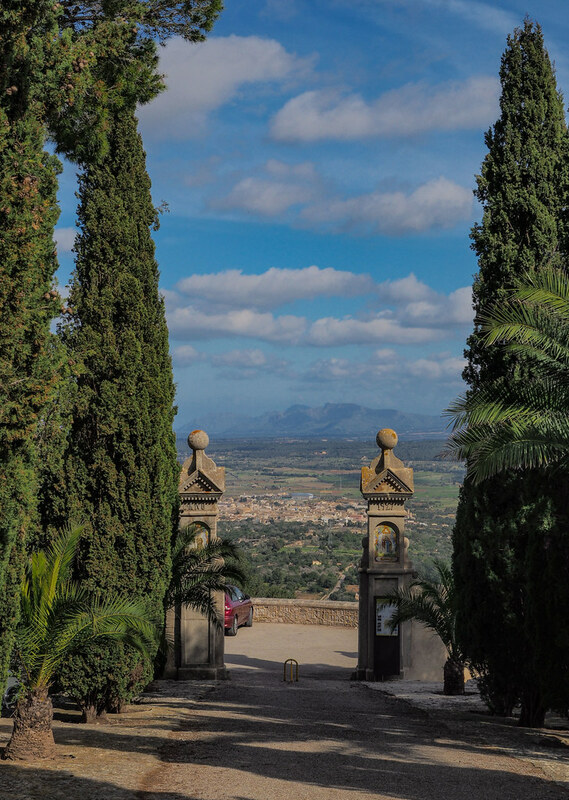 And, do we like Mallorca? 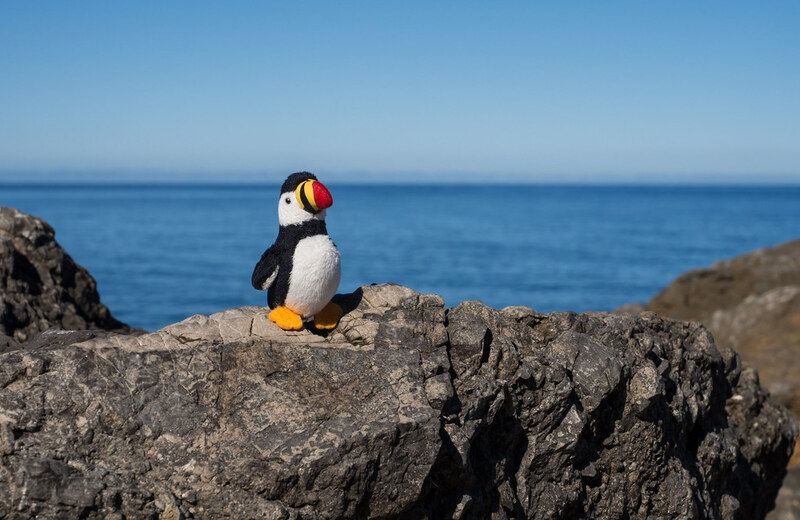 My Icelandic travel companion and island tester: Of Course, just behind New Zealand. 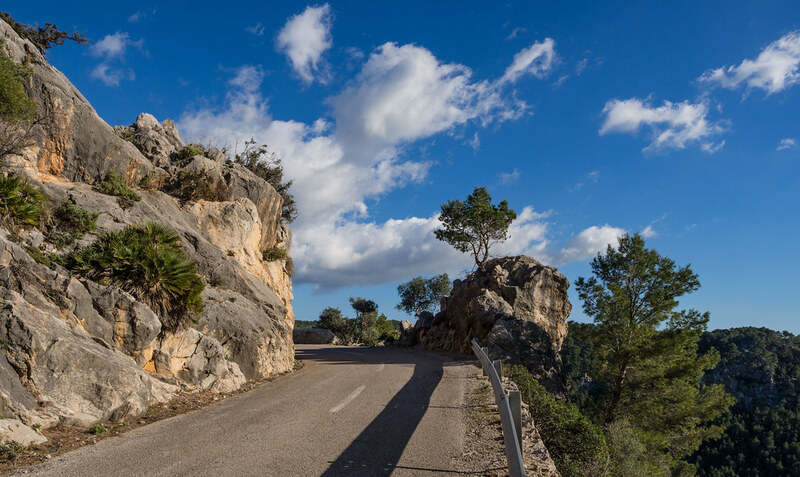 Even at the uphill, don't leave the road, the little rock wall is only to be seen as a recommendation. It's weekend, the two-wheel traffic increases, at the gas station before Valdemossa a lot of old BeEmWeh and Duckatie waiting for attention. In addition, the engines roar from the south. However, this is a car mountain race event. 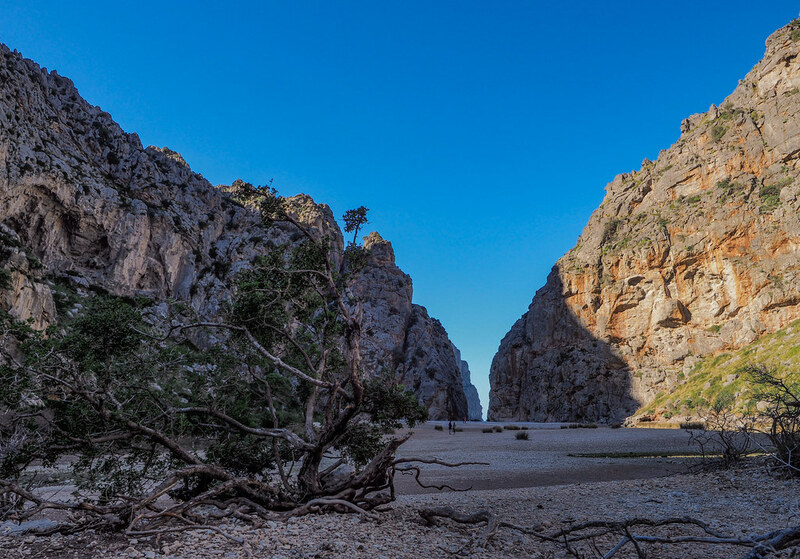 Therefore, the road is closed to the valley and according to the village Sheriff, it is a longer walk to the action. 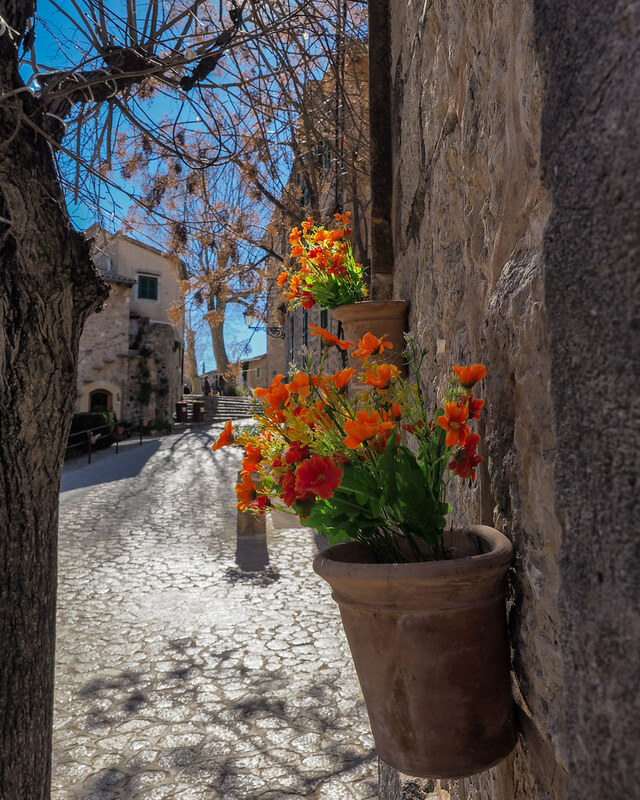 Too warm to hike, so I deliver boring photos from Valdemossa. almost vintage, note the winter gloves . 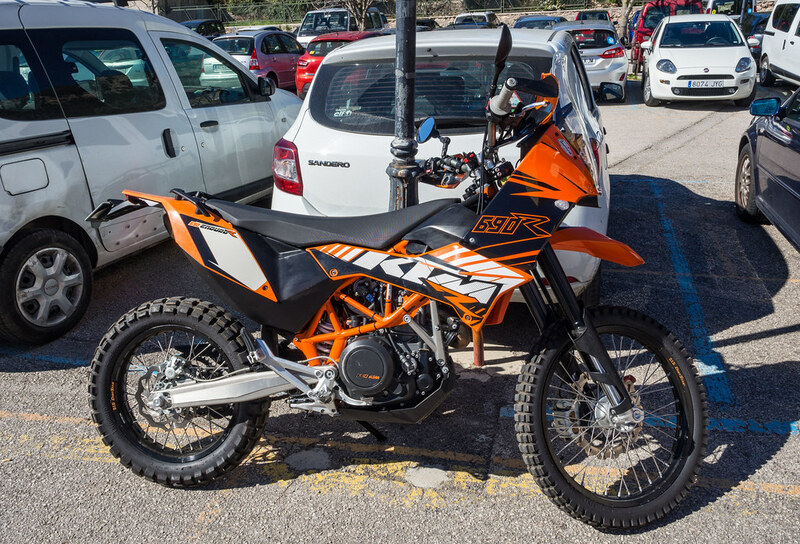 could be already 10 years old, swap Yamaha for KTM. 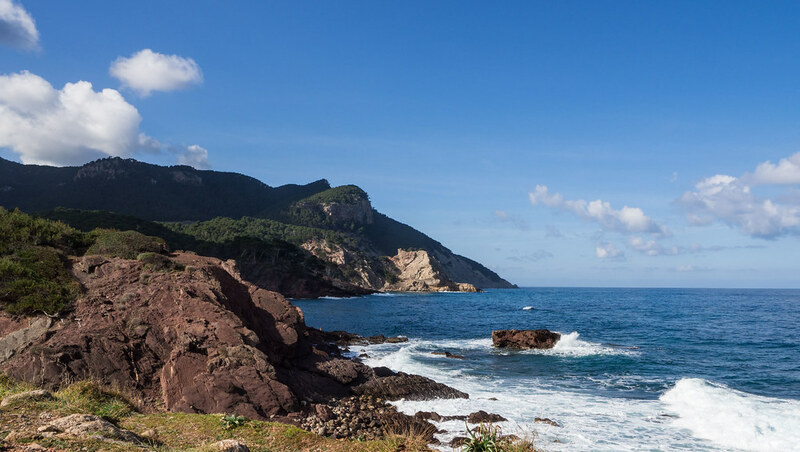 So I drive the coastal road and turn left on the route to Capdella. Well known, only the other way around. The traffic is much lower, only a convertible from Munich comes across. Always keep right, dodging can be tough. 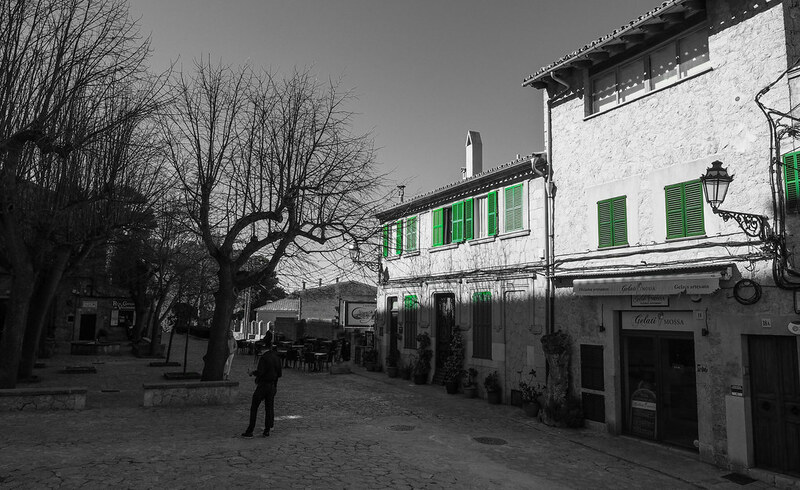 At the weekend the Cafe Sa Placa in Galilea is open. Luckely I get a chair on the terrace, surrounded by locals. Could not be more beautiful, except for a little "I'm not German" moment. A German, older racing cyclist enters the scene, sees the full cast, roars "bed changes" and leaves again. I put on my best Spanish face and devote myself again to my salad. 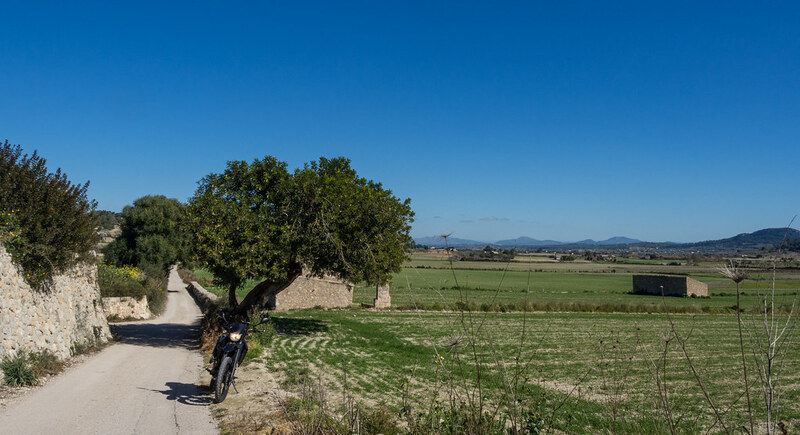 on the roadside standing three KTM enduros, seems to be the Palma motorsport area. 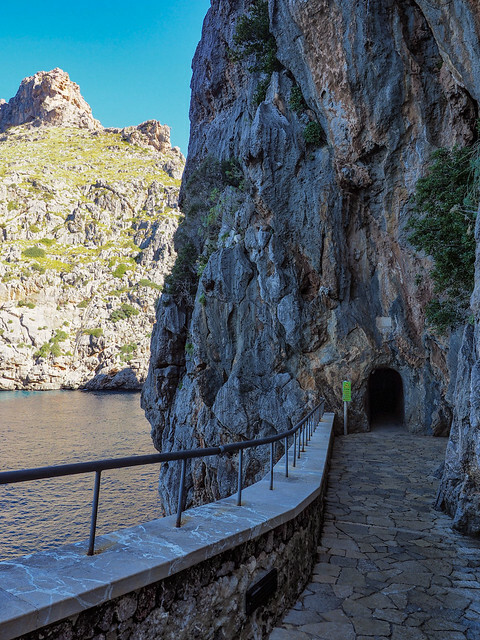 Only two more tunnels and I walking at the home harbor shore. Today, stylish in the hotel "lounge area" at the waterfront, sipping a copa wine, listen to various musicians from the playlist and watch the Spanish bustle. In the evening, visiting the bar Alabatros, delicious grilled sardines and a well tuned pa amb oli. At the hotel the flat screen made a small bang and breathed his life out. Ok, no evening movie, doesn't matter, the sea air makes you tired and leads to an unfamiliar early bedtime. B10Dave, eaglescan, Halen and 1 other person like this. Wonderful, Stollen - looks like a great trip. 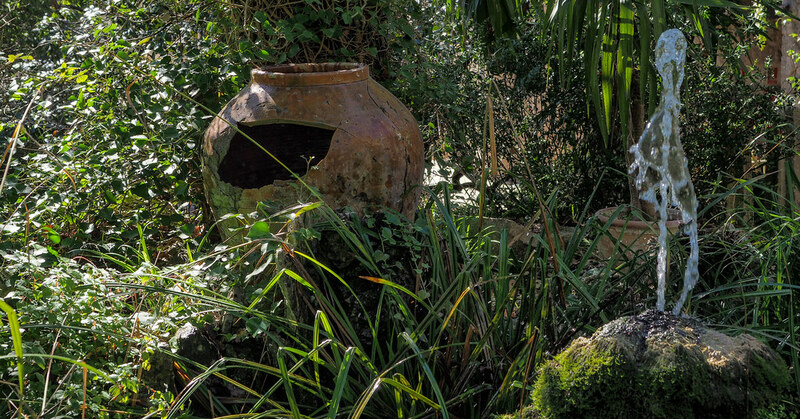 Thank you for sharing these great photos! Last day, finally done. 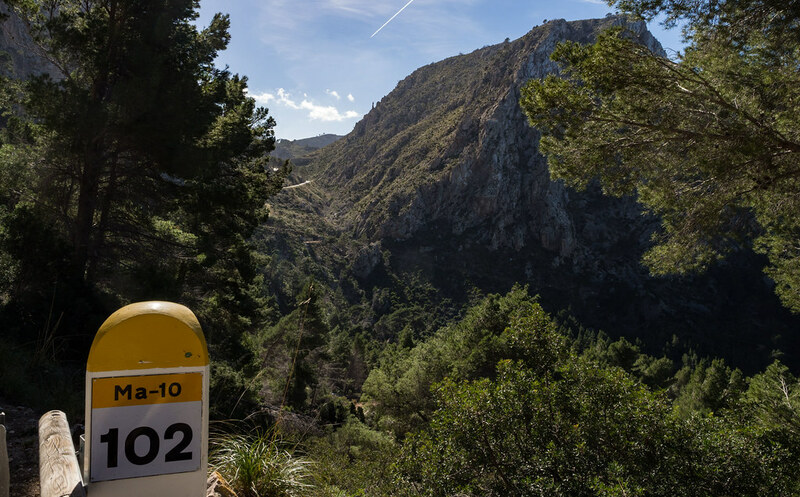 I should take the last day easy, I have my experience, actually ......But there are still the GPS tracks and I remembered the i-prueba-de-orientacion-mallorca-2018-ruta -off one. Orientation , try and be off road sounds nice. 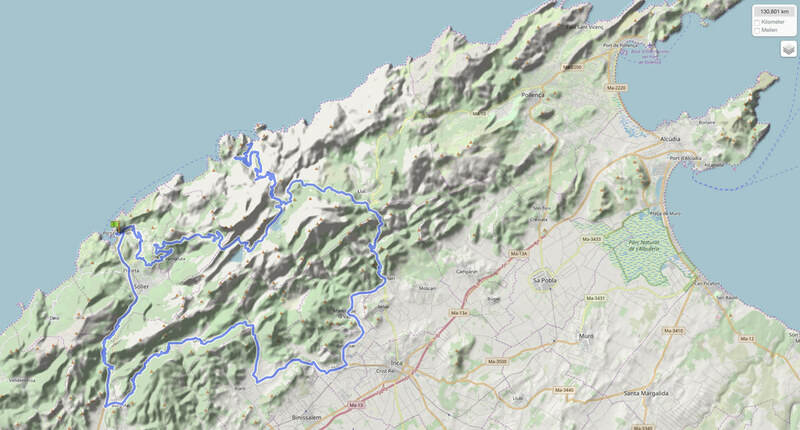 From Palma a little twisted route through the island to the north/east coast. 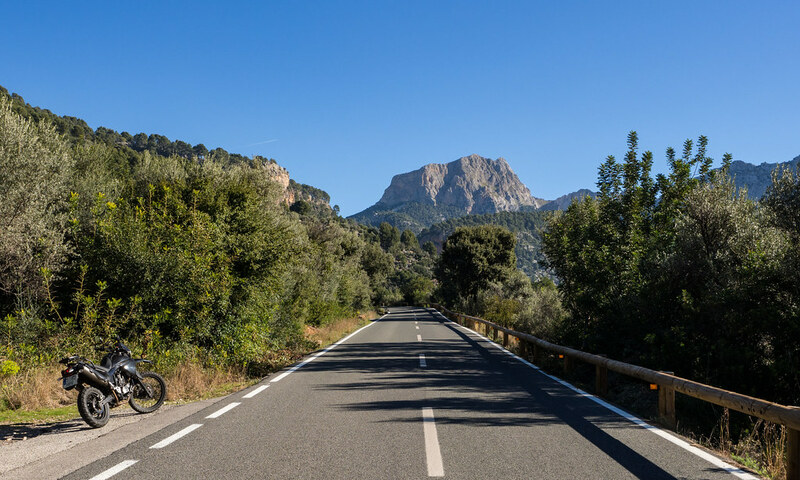 This could be easy combined with a return trip through the Tramuntana to Port de Soller. After fast 18 km south I switch into GPS mode. Seems to be dangerous, once turned wrong and you end up in the cactus desert, so much for your own orientation. But after the next junction you are already off the road. 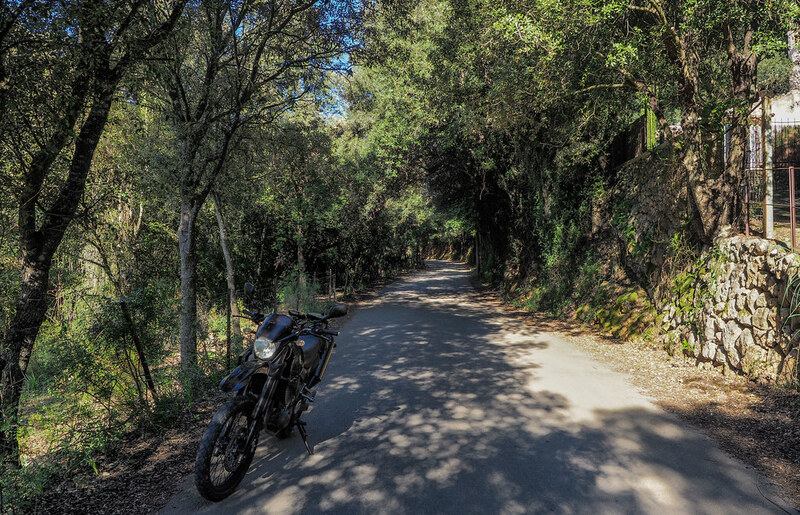 A last piece of asphalt and you turn on the Cami Son Mascaro, also called Sin Asphalto. On the next section, the islanders could not decide and tipped a strange mixture of sand and tar into the terrain. 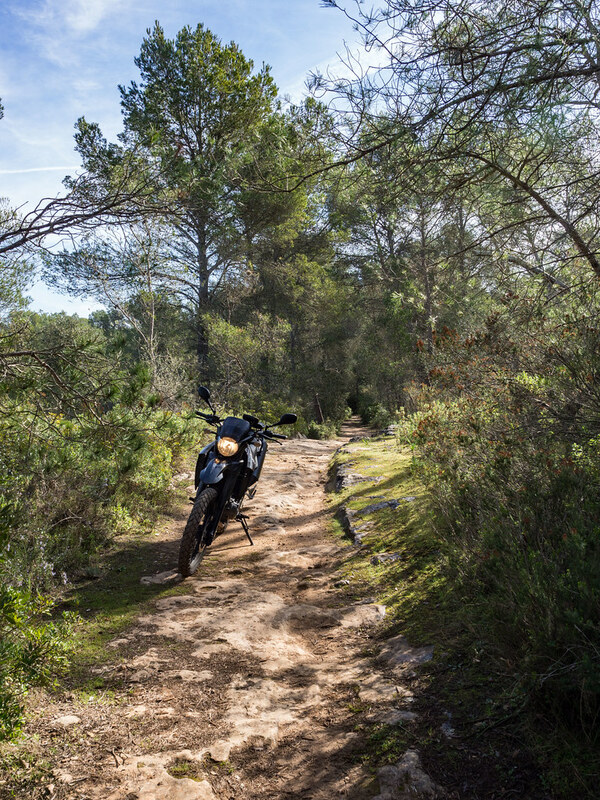 After that, the road becomes narrower and rocky, the oil flushed through the poor old suspension elements. 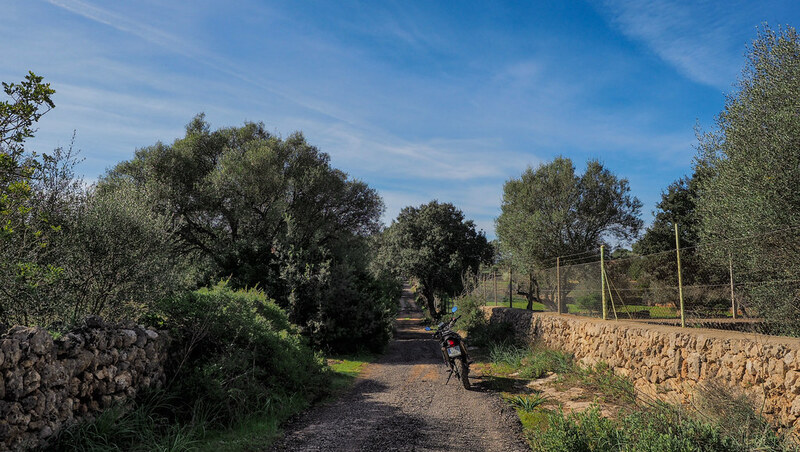 Guess what, there are nice dirt roads on Mallorca. And the middle is beautiful green. 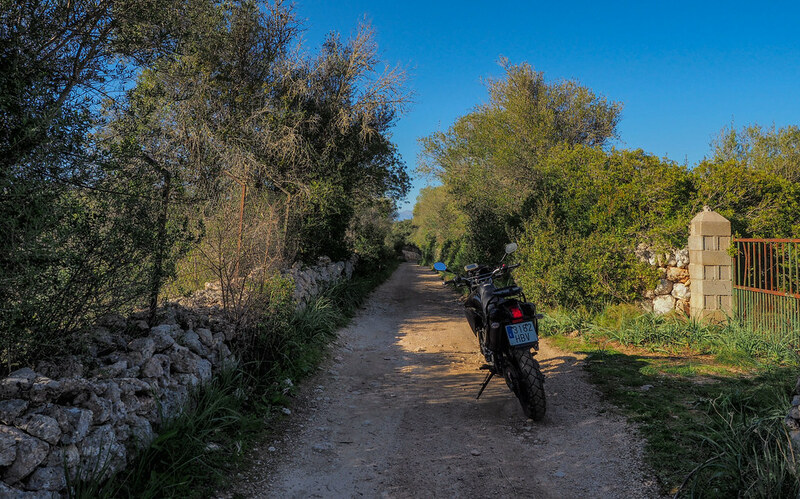 In between, it is even steep, some gravel and rocky, the tour has clearly been driven on a dirt bike. Only around Montuiri you come back on asphalt. 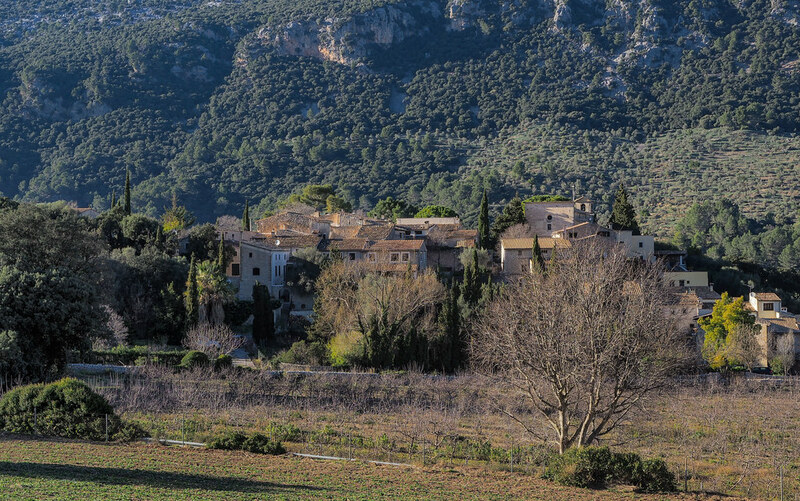 Unfortunately the recorder did not record the driveway to Randa and I missed it, next time. 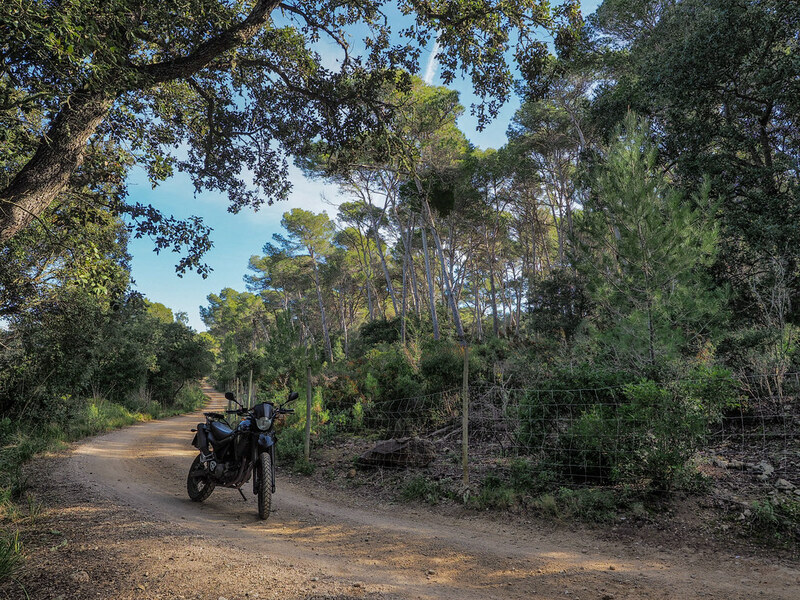 A bit of asphalt on the narrow supply roads along the highway, again I turn on dirt roads and luxury entrance. 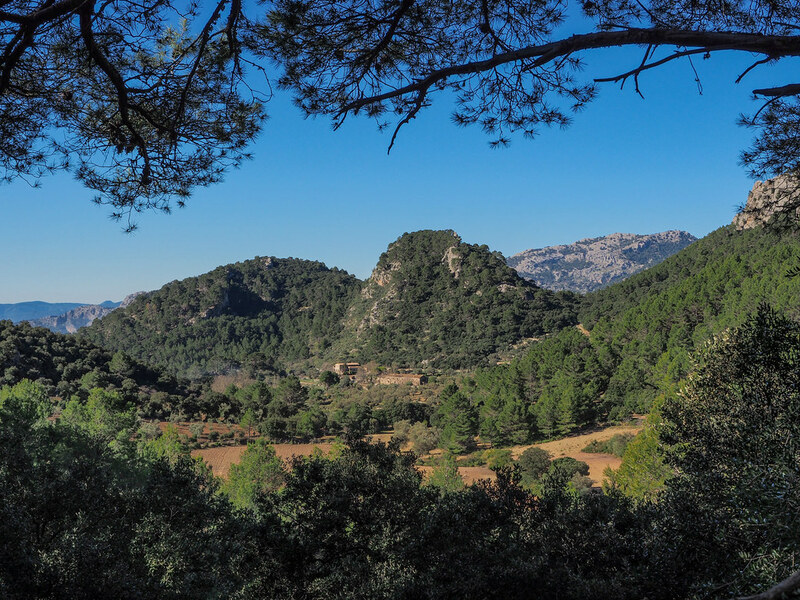 The Puig de Bonany with its monastery comes in sight. The track actually goes to the left, but the following driveway is to rocky, so I drive straight away. 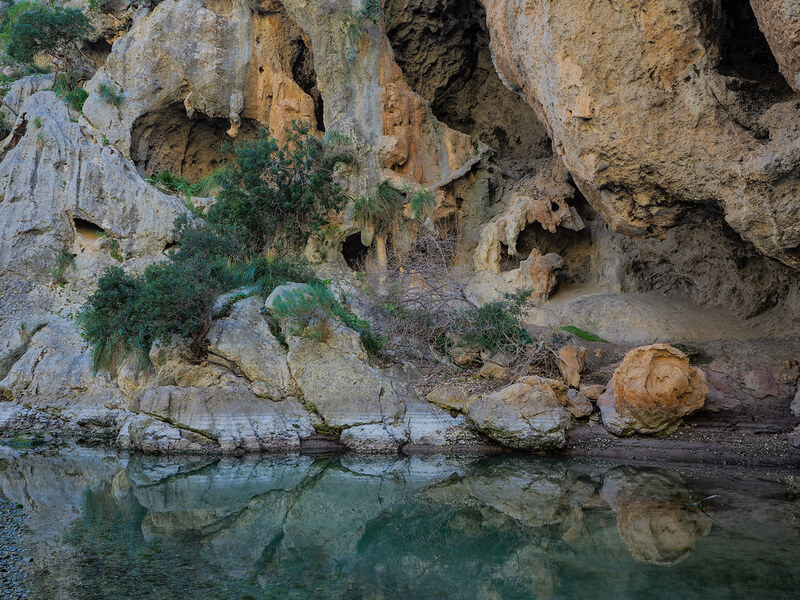 In order to get back on the track I take advantage of every waterhole. 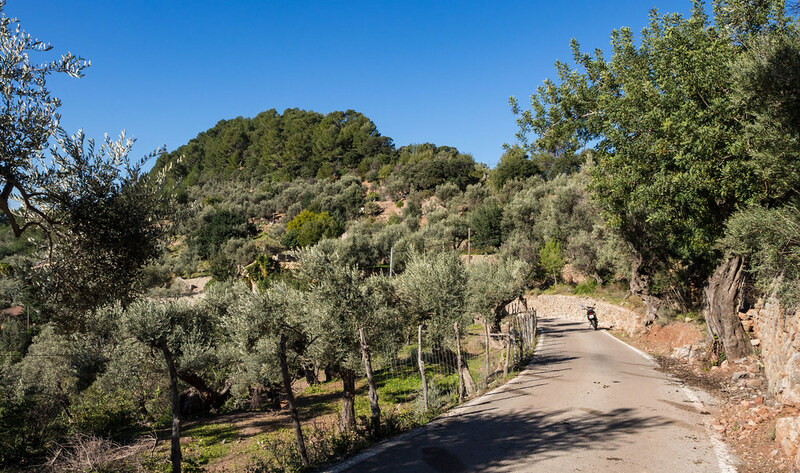 Before the Puig it is again too steep and grainy for the Yamaha and driver but the bypass to the car-friendly driveway remains sandy. Unusually busy place, but it's Sunday. As always wide views into the country. 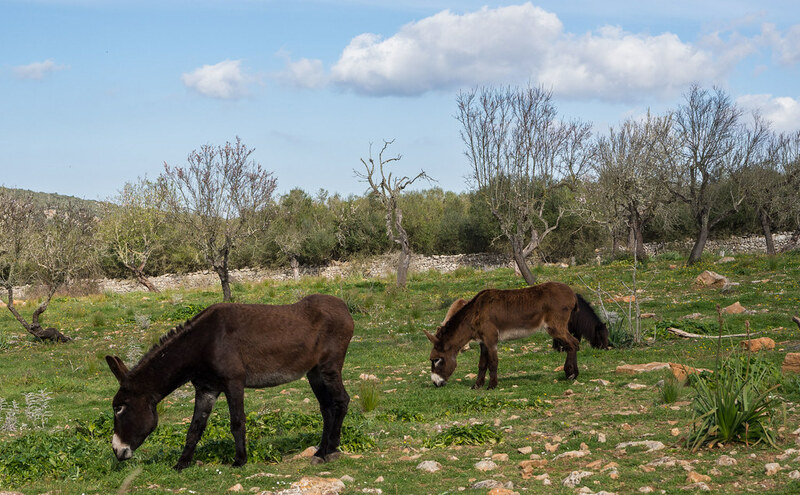 After a nice descent on a paved Cami, I decide against the electronics track, shorten a few dirt roads kilometer, follow then almost roadless the satellite to other donkeys. 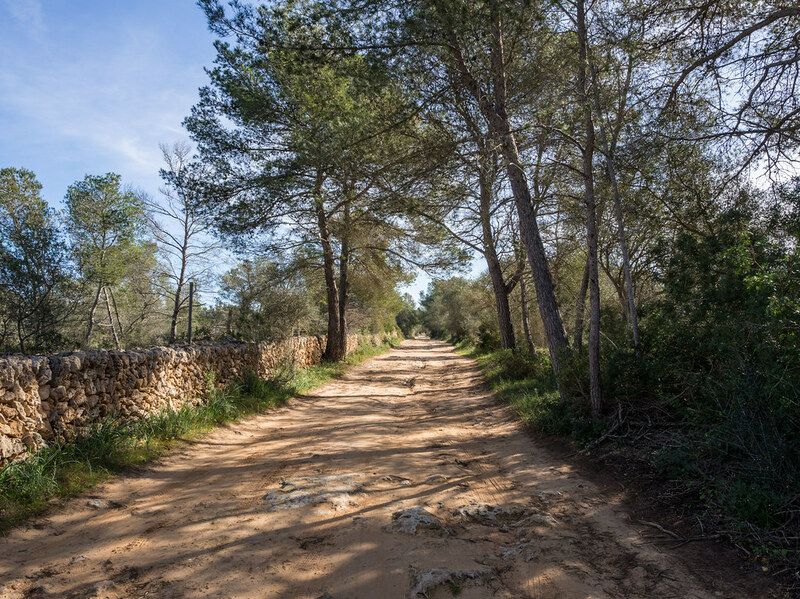 Not far and only a few kilometers to go, the last on fine gravel roads to the beach in Son Serra de Marina. These were the best 130 km on the island. 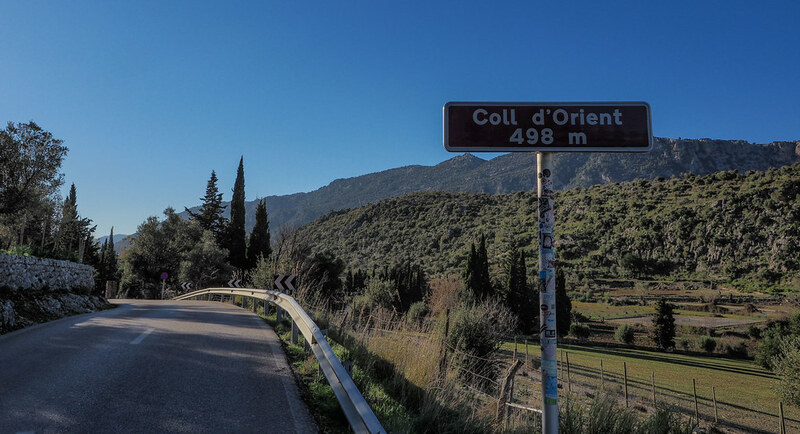 I'm still working on a short, beautiful route to Port de Soller. The GPS "talks" about 90 km, perfect. 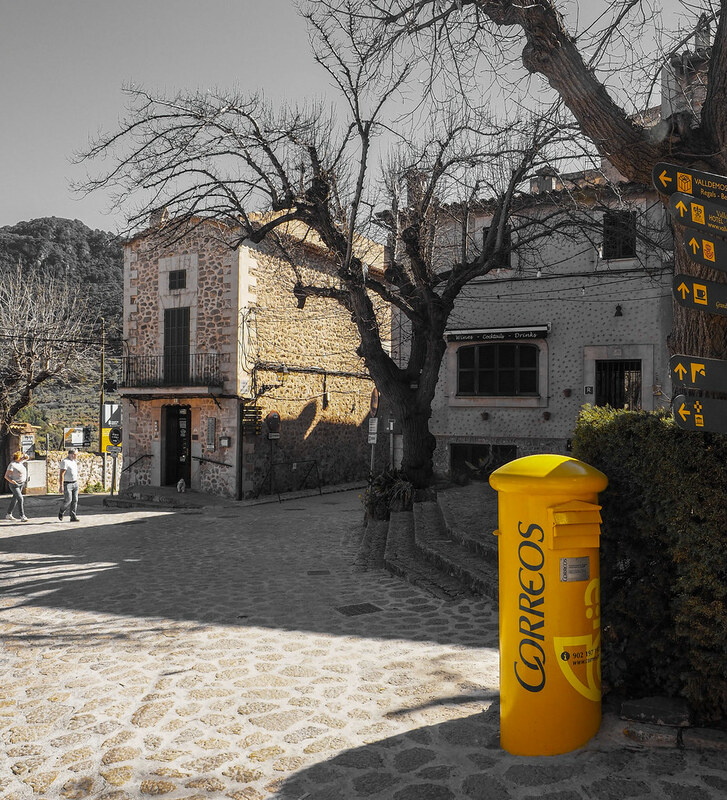 It also helps with the petrol station search in Muro, consider Spain, Sunday afternoon. 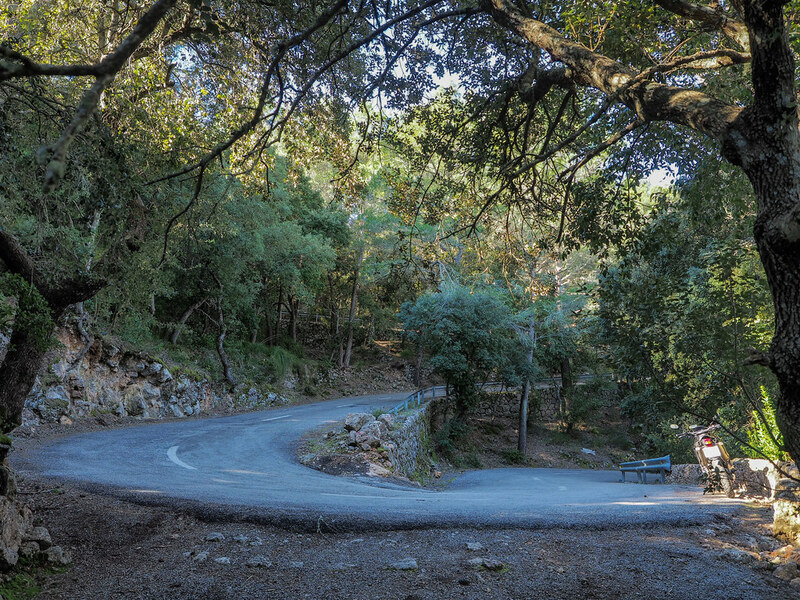 Trough Selva towards the monastery Luc, at the junction towards Soller, through the plateau along the Puig Major, at the downhill two drivers and their cars perform the sport of cold metal deformation. Doesen't matter after that beautiful day, I turn in my lane towards the harbor. 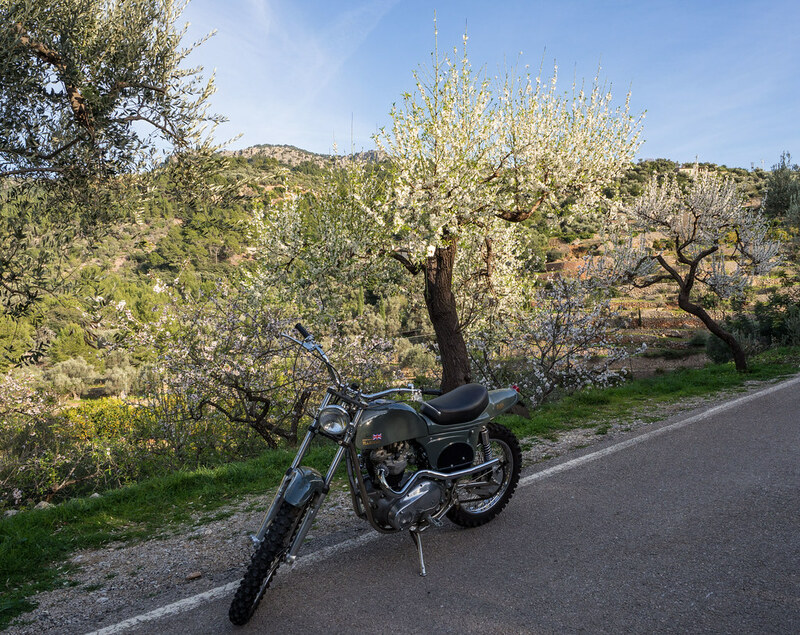 A farewell photo with the almond trees would not be bad, park the Yamaha beside the road. From behind an exhaust roars, I take the eye from the viewfinder and focus two British vintage pieces, one above, one below. First he tried it in Spanish, after the borders were cleared, we changed into his mother tongue. 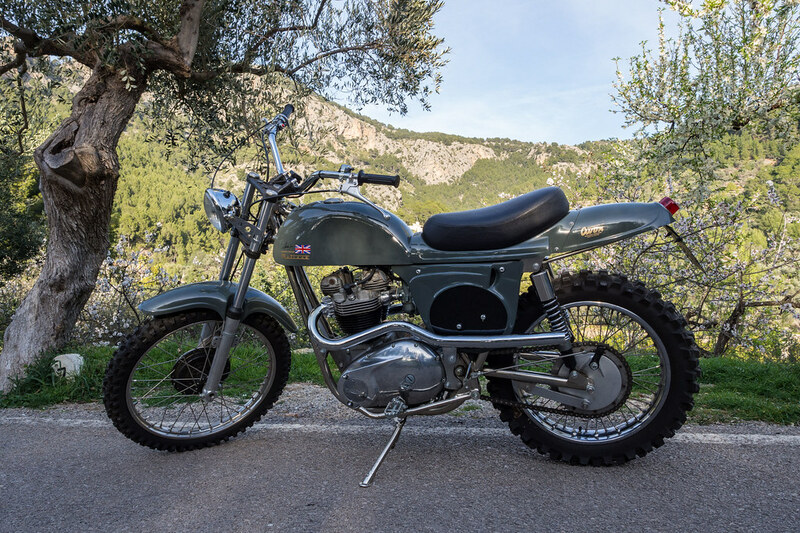 The classic piece on two tires is a Metisse Desert Racer Replica, known from On any Sunday with Steve McQueen. Whether I know the movie, conditionally I answered. After a long fun conversation, shared interests and shared humor, shake hands and good bye. Showers must wait, last cold beer at the port. Food is taken at Es Racó D'Es Port, buenas noches. 6.30 in Mallorca, dark, cold. At 9.15 the plane takes off. On the way to the rental is the airport, before returning the bike, checking in the bag sounds like a good idea. Good thought, the best, as I found out later. Checked in the luggage, only 10 minutes from the airport to the rental. At 8.00 o'clock I stand at the shop, still no one there, ok, Spain. After ten minutes I pick up the phone, no one there. The key is already in the mailbox, so a taxi might be the solution. 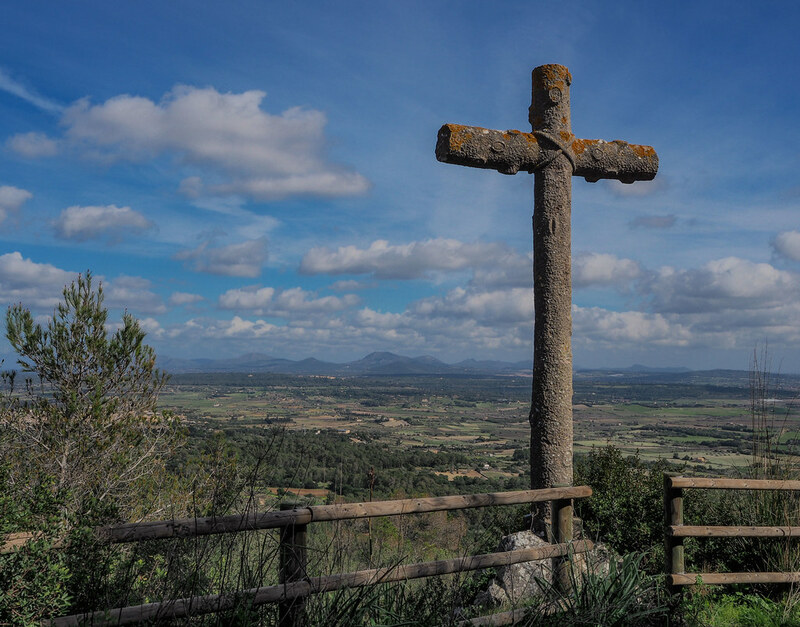 Find out that calling a taxi in Spain is not so easy. Stroll to the beach promenade and ask a friendly Spaniard to get me a taxi. Apparently it is more common to walk to the next taxi rank, which would be about 10 minutes away. Nevertheless, the taxi should come in five minutes. After a quarter of an hour, I allow myself to jog to the taxi rank, motorcycle jackets are warm. The rank is well filled, so jumped in quickly, the driver still says, si, rapido. Rapido does not always seem to mean fast in Spanish. 8.50, the gate number is no longer on the main scoreboard, great, no matter, I sprint through the security control, yes, you can. Above the confectionery section, the display shows C46, Last Call, through the confectionery, to the C46 it takes 5-10 minutes. In record time, panting and stinking I stand at 9:05 at the gate. Asked if I got lost or miss the right way, a friendly answer doesn't comes in my mind, so my mouth stays soundless. There is a lot of snow down in the Pyrenees and I'm still wet up here. Holiday would not be bad. Two days later, the rental owner calls me, apologizes many times. He screwed off the GPS ball joint mount and send it, arrived a week later. After all a friendly Spaniard. B10Dave, JagLite, Bors and 1 other person like this. Great ending to a fantastic ride report! Classic motorcycle days, INDEED! Stunning, Stollen. Reminds me of Ibiza oh so many years ago. Thank you. Respect.